OK, so the gorgeous yellow-orange Fairburn was the highlight of my rockhounding trip this weekend, but it certainly wasn’t the only “find”. 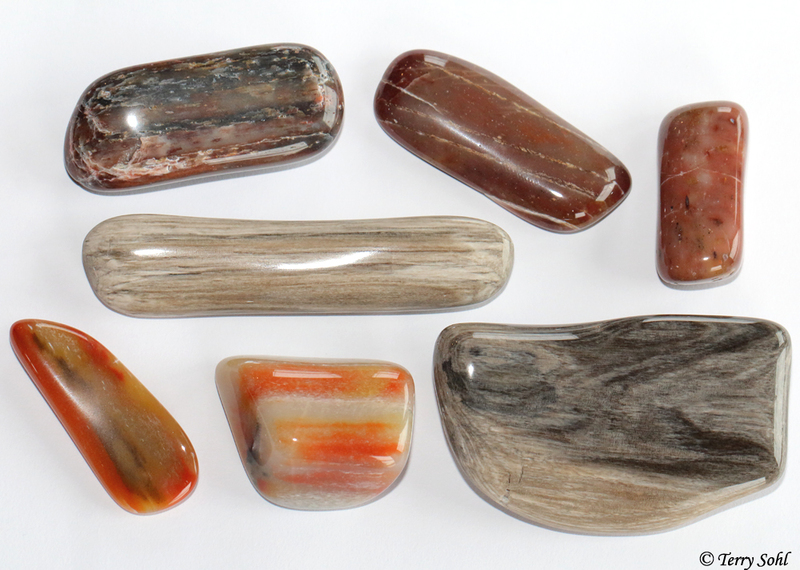 Here’s a selection of some of the other agates, jaspers, etc. What amazes me about this location on the Buffalo Gap National Grasslands is the seeming infinite variety of what you can find, all within one very small area. All of these were collected within a one-square mile area. 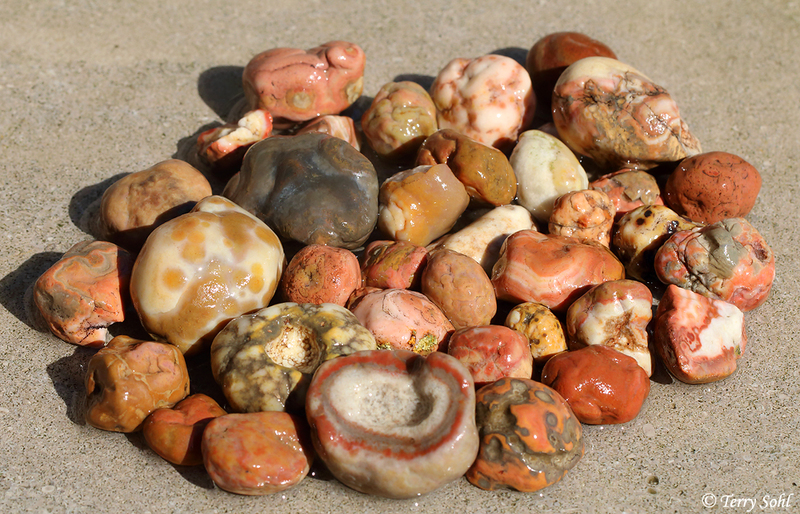 A collection of Prairie Agates, something you find relatively often on the Buffalo Gap National Grasslands, but they’re so pretty and so variable that I can’t help but collect more. This one was SO striking when I saw it lying there that I couldn’t help but collect it. I admit however that I have no idea what this is…any ideas? 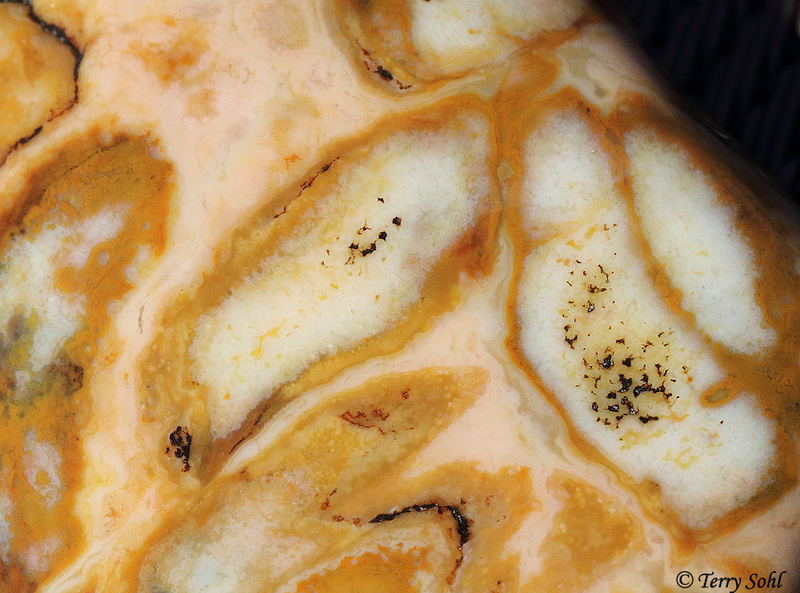 A gorgeous prairie agate (or what I’d call a prairie agate), with some very intricate banding and patterns. The green is a bit of lichen I have yet to clean off. Bubblegum agates! I actually have a somewhat difficult time finding many of these, but always pick them up when I do. 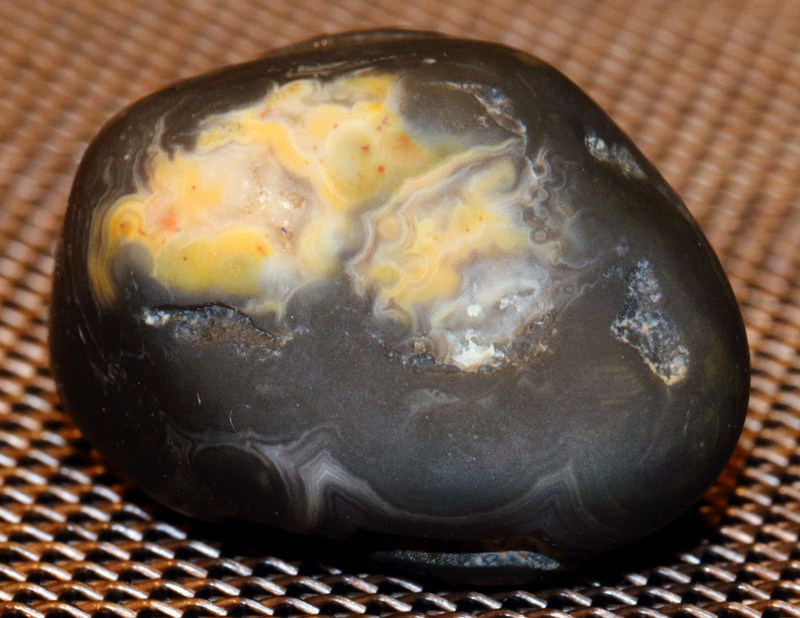 Of all the stones out here, it’s the bubblegum agates that really “shine” (ha) when I put them through the polisher. 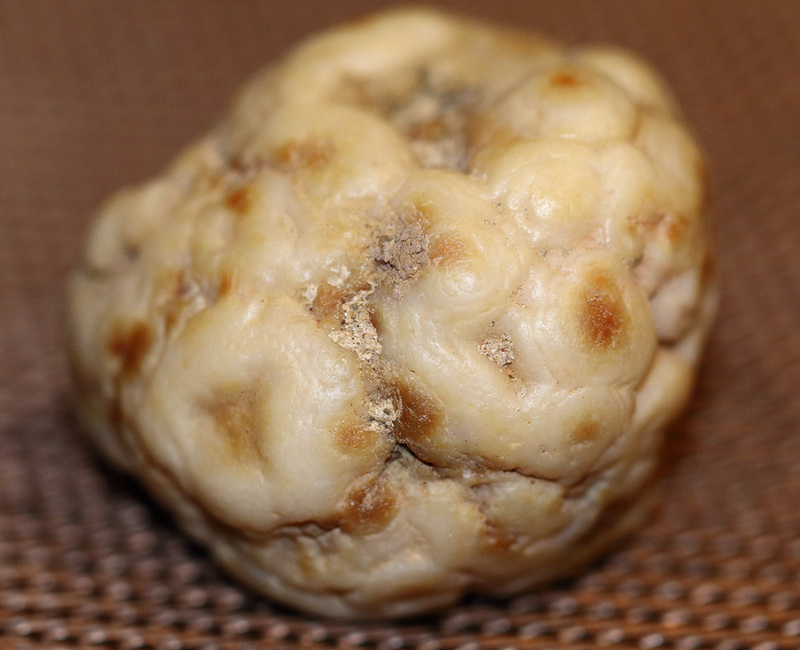 Once you start to wear down those nodules, there are often some truly incredible patterns and banding underneath. Stones like this make me want to take a hammer and break every stone open. 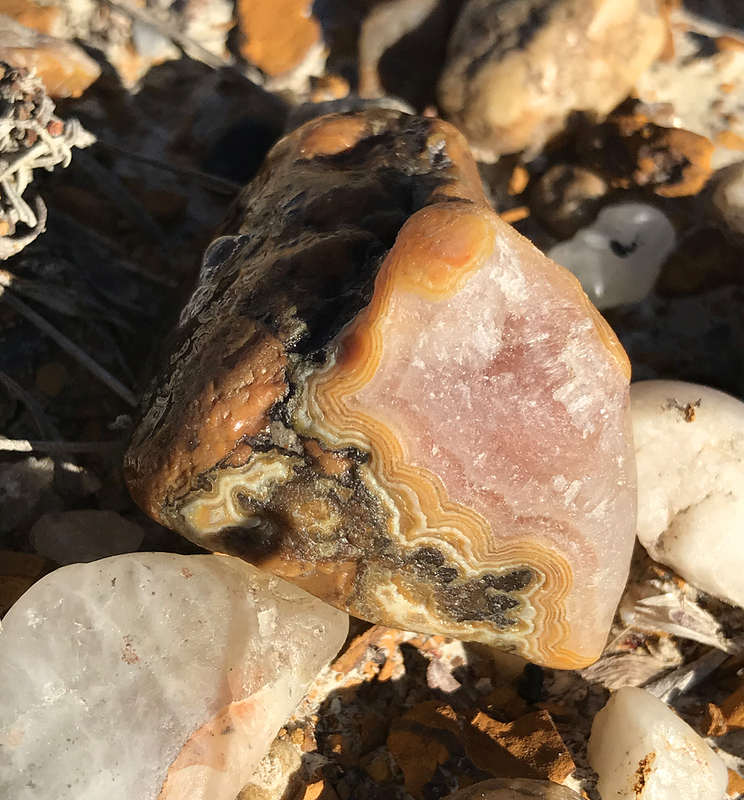 I don’t have a rock saw or anything, but I imagine there are SO many hidden treasures like this on the Buffalo Gap National Grasslands, pieces where you don’t see the beauty unless you slice them open. 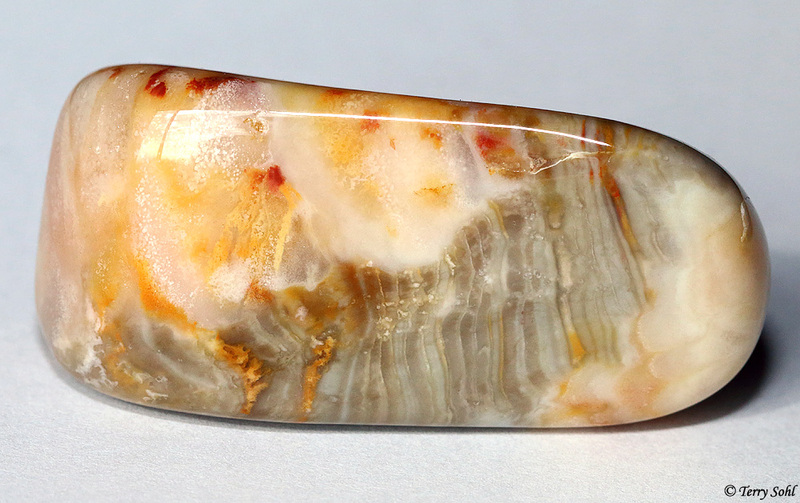 A prairie agate. 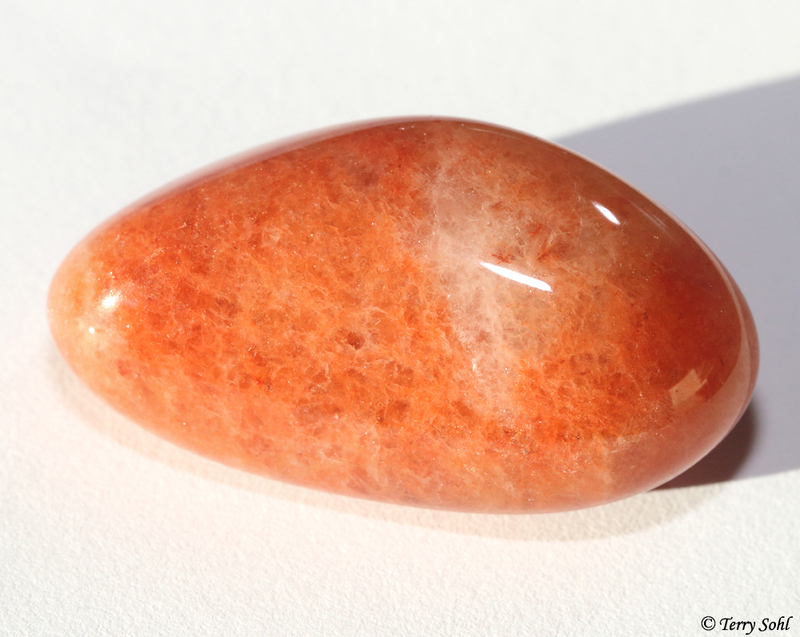 The orangish ones are probably the most common, but there are some pretty red tones in many of them as well. 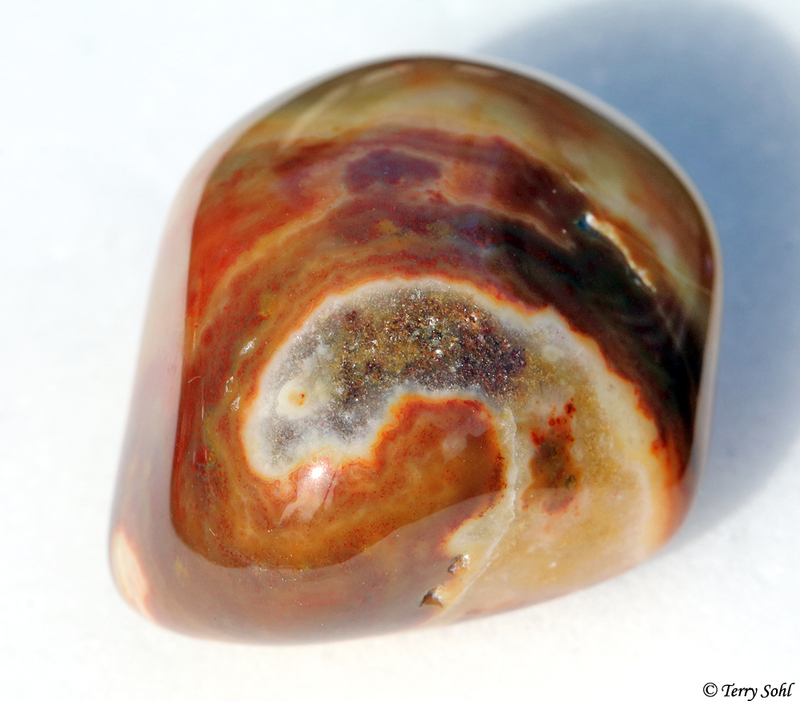 While many agates have the banding patterns shown on this post, there are some other cool patterns you find as well. 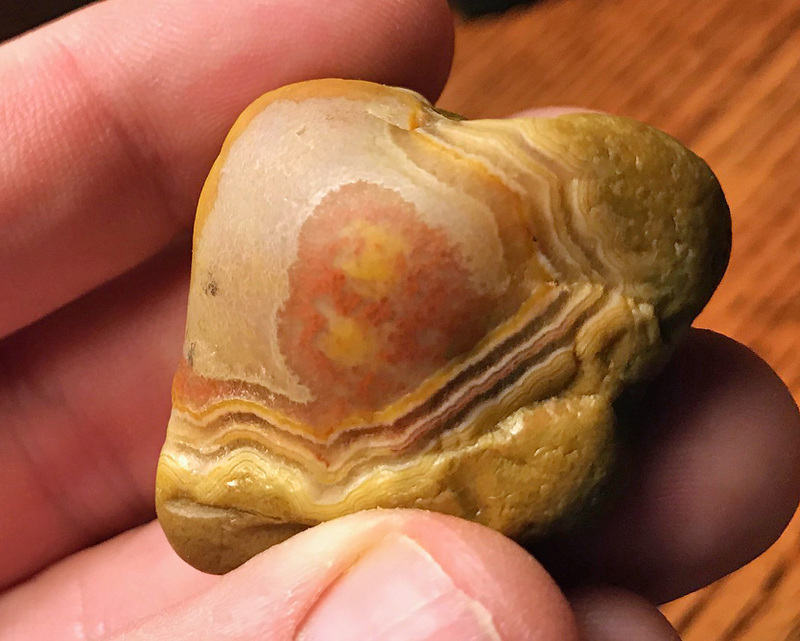 Love the pink “druzy” crystalline area that forms the heart of this agate, with some banding and other patterns around it. 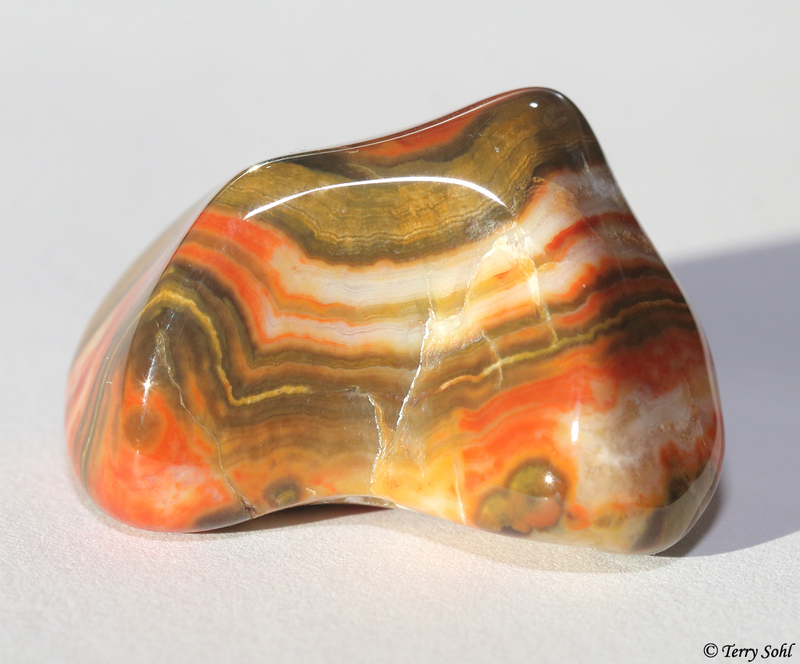 A jasper, of which there are many on the grasslands. 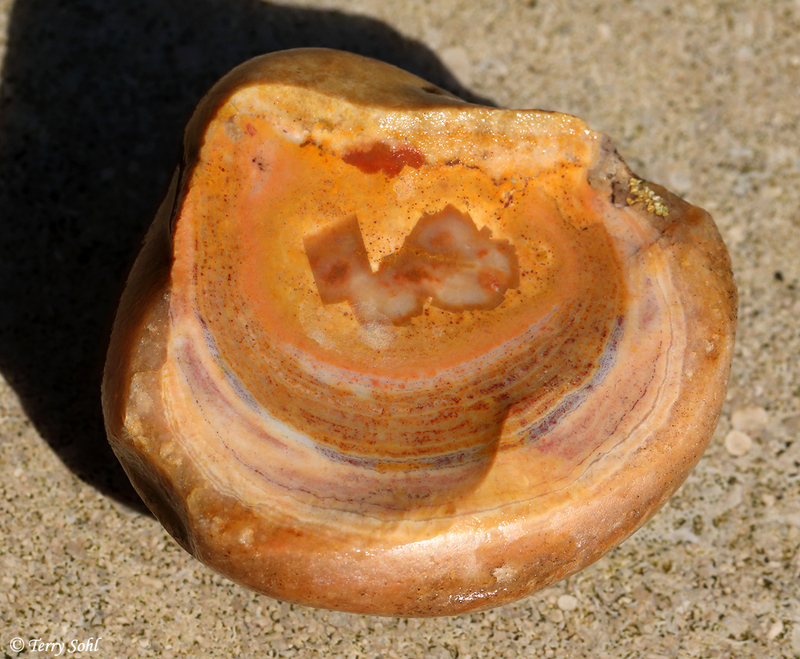 One more agate (at least that’s what I’d call it), with some interesting fine banding. I’ve been on vacation for a couple of weeks, and have been playing catch up since getting back a week ago. Hence no blog posts for a few weeks. One advantage of being gone…my rock tumbler continued to carry on, and finished off a really beautiful batch that I’ve been working on the last 3 months. 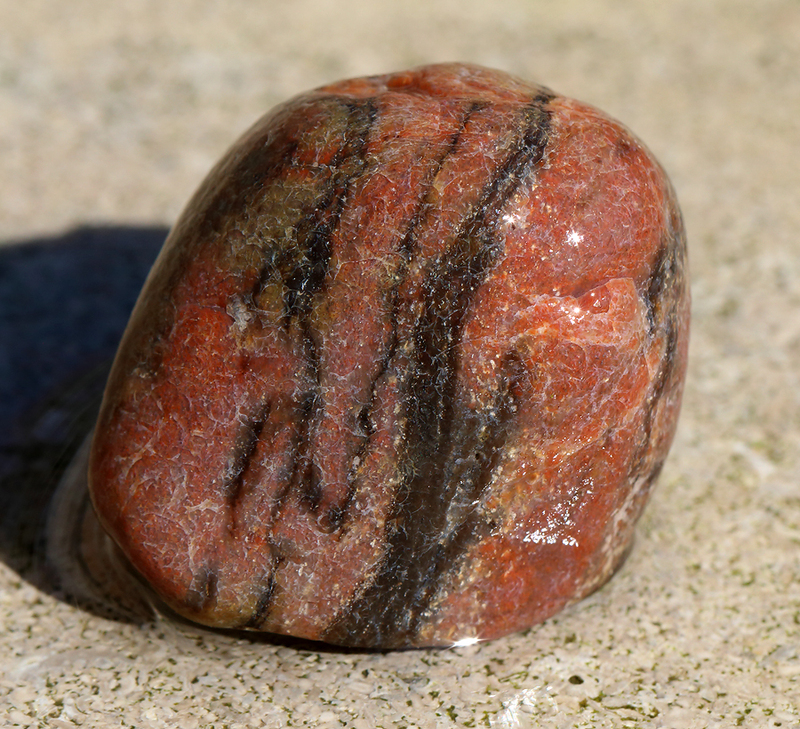 It’s one I’m particularly fond of, because every stone here is one that my son and I found on the Buffalo Gap National Grasslands here in South Dakota. I guess I have a hard time classifying these, although most are prairie agates, with some bubblegum agates, jaspers, and quartz as well. Photos of the latest batch (click on the smaller ones at the end for a larger view). 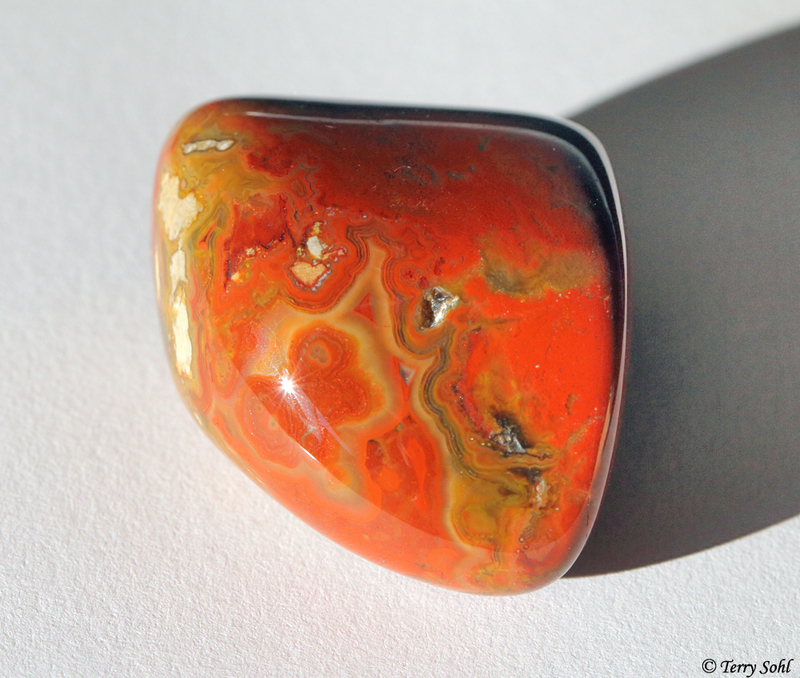 New Polished Batch – Best Yet! 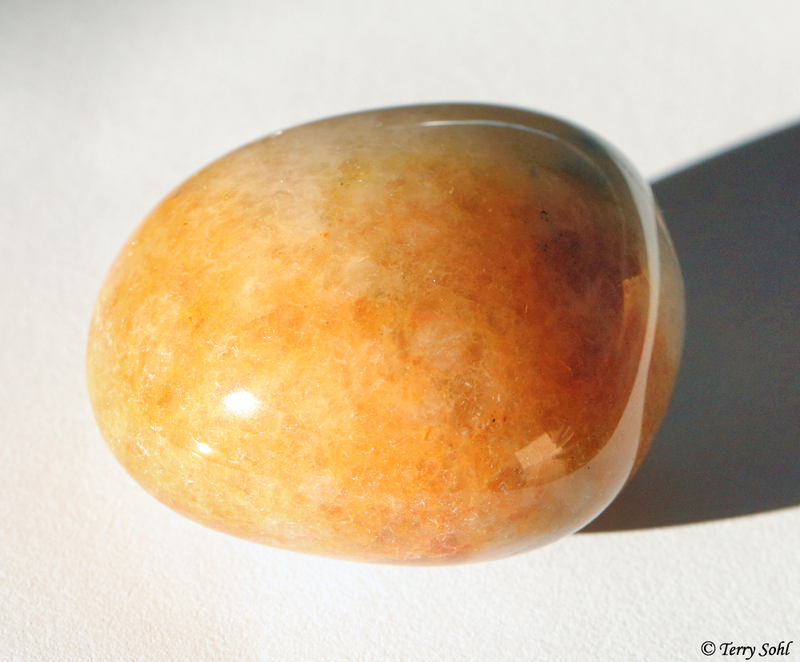 There are two moments in polishing stones that are akin to Christmas morning for a kid. One is after the first rough polish. 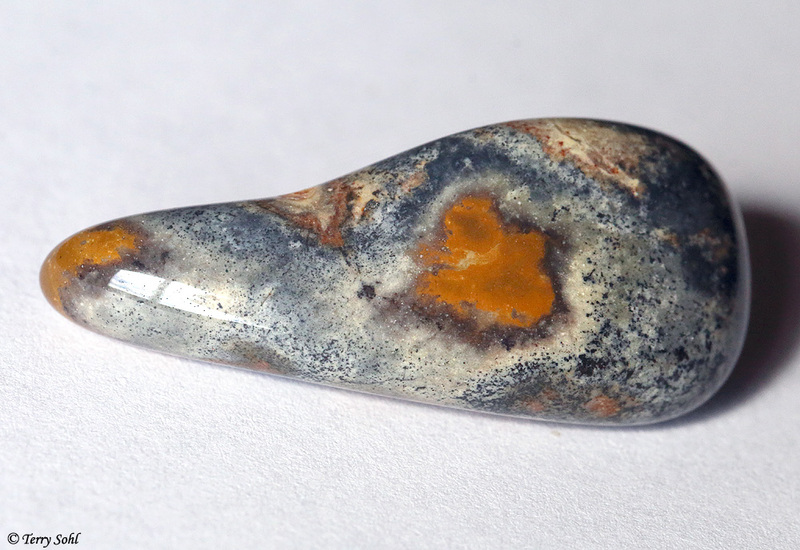 It’s at that stage where you get some wonderful hidden surprises, where the rough polishing has removed outer material and exposed some beautiful patterns underneath (happens a lot with bubblegum agates, for example). The second big moment is taking a batch out of the final polish. It’s a long process to polish rocks! I’ve learned patience, and it’s usually a two-month process to go from rough material, to a beautiful, shiny final product. Here are photos of the latest batch…my best yet, without question! 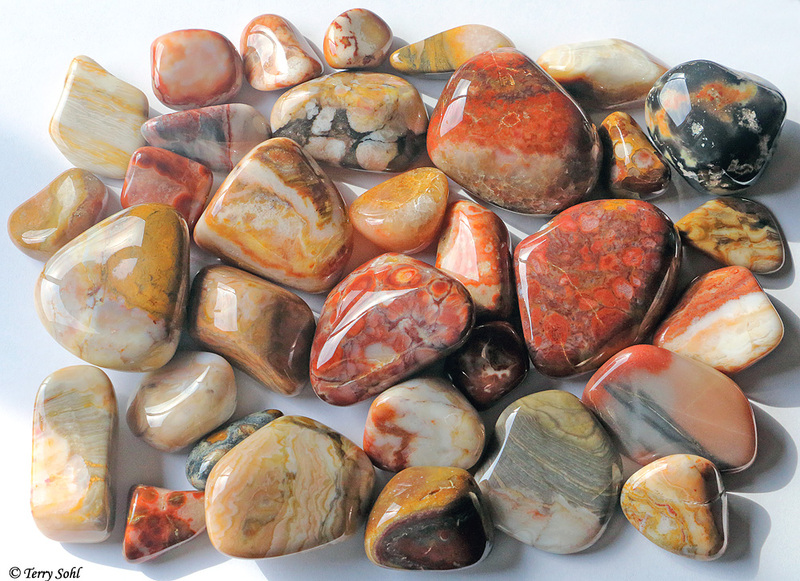 A wonderful mix of agates, quartz, petrified wood, and jaspers. 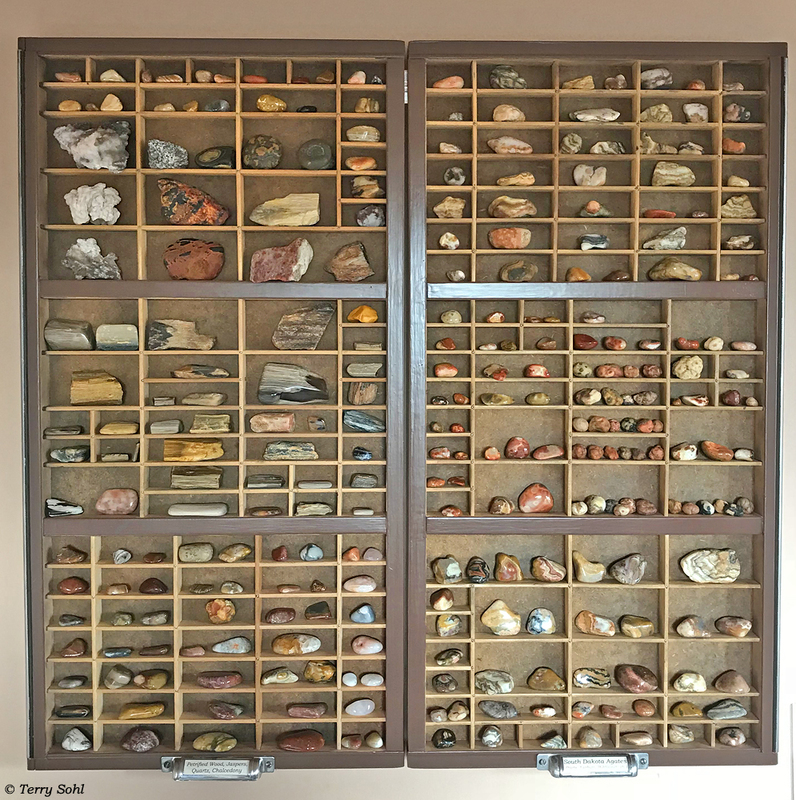 And the best aspect of this batch…EVERY piece was self-collected, on the Buffalo Gap National Grasslands here in South Dakota. An overview of the final batch. 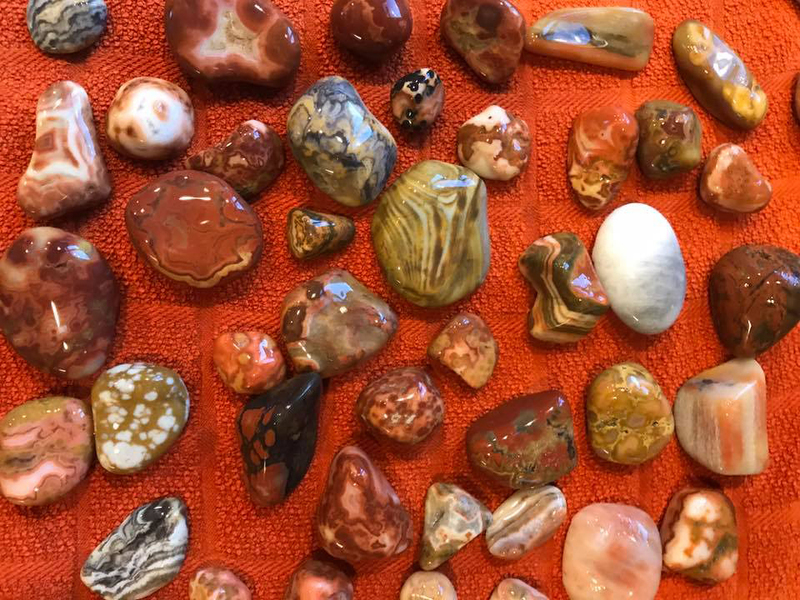 In this batch, I included a wide variety of stones, including many different agates, petrified wood, quartz, and jaspers. The one thing they all have in common…they all came out WONDERFULLY shiny! A surprise! 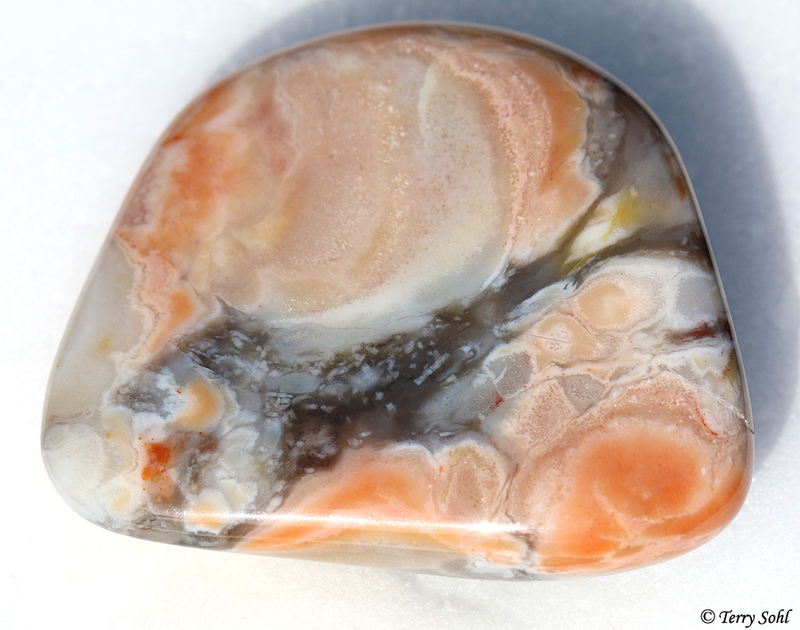 This is one of those agates where there’s a surprise underneath a weathered outer layer. I suspected there might be something special underneath the heavily weathered exterior of this piece. 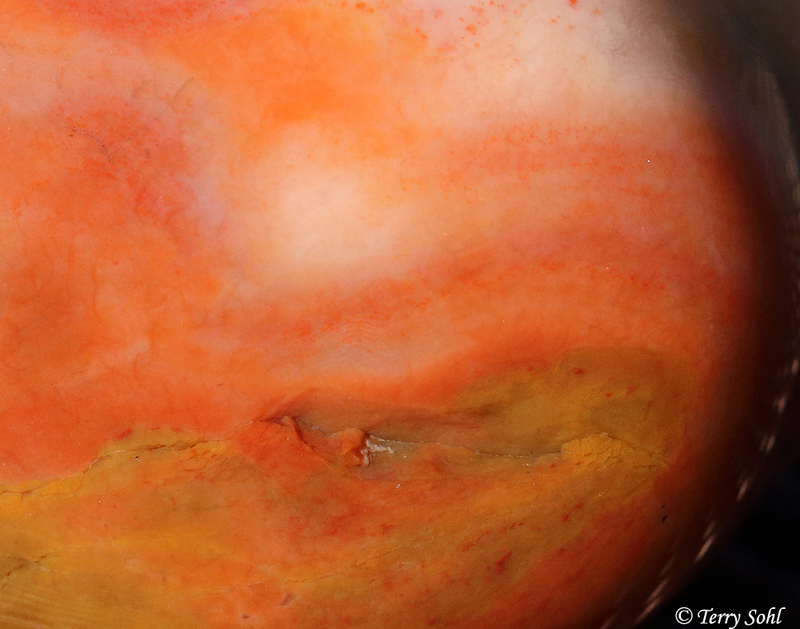 There certainly is…the beautiful, fine banding of a Fairburn agate. 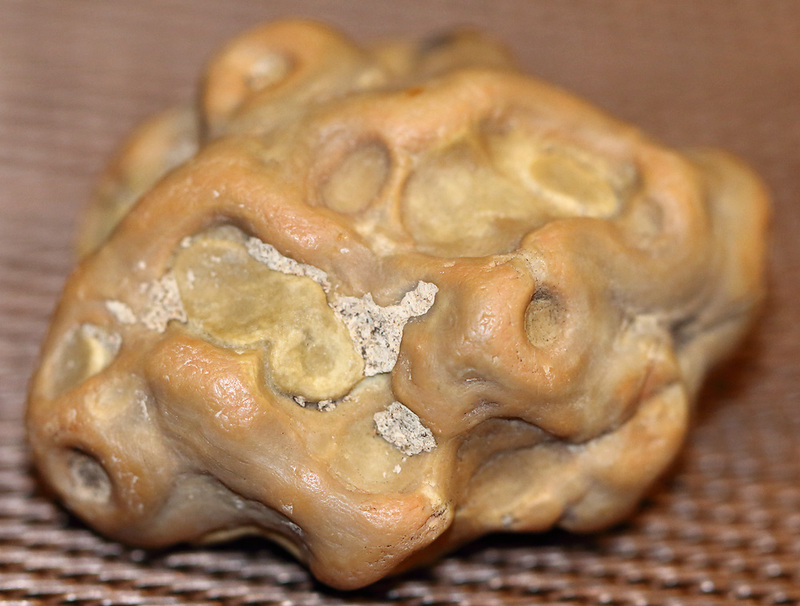 Typical bubblegum agates. 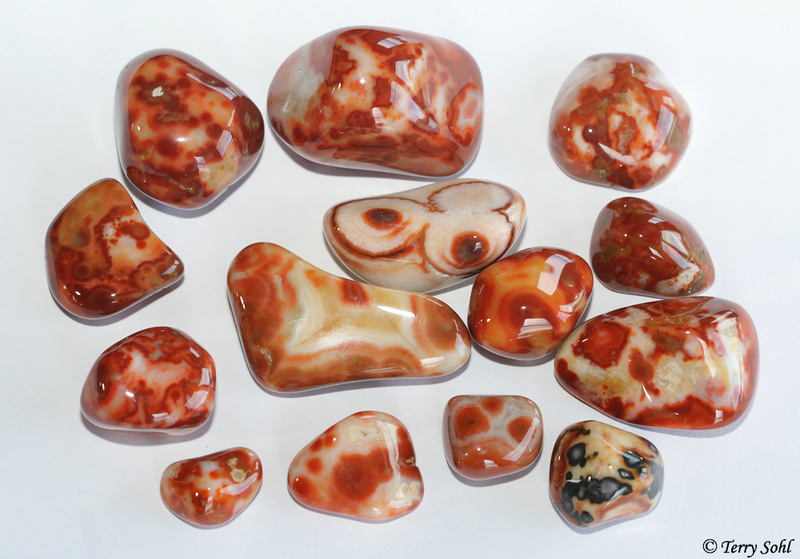 Once polished, most seem to show the reddish and cream colors of the agates shown here. 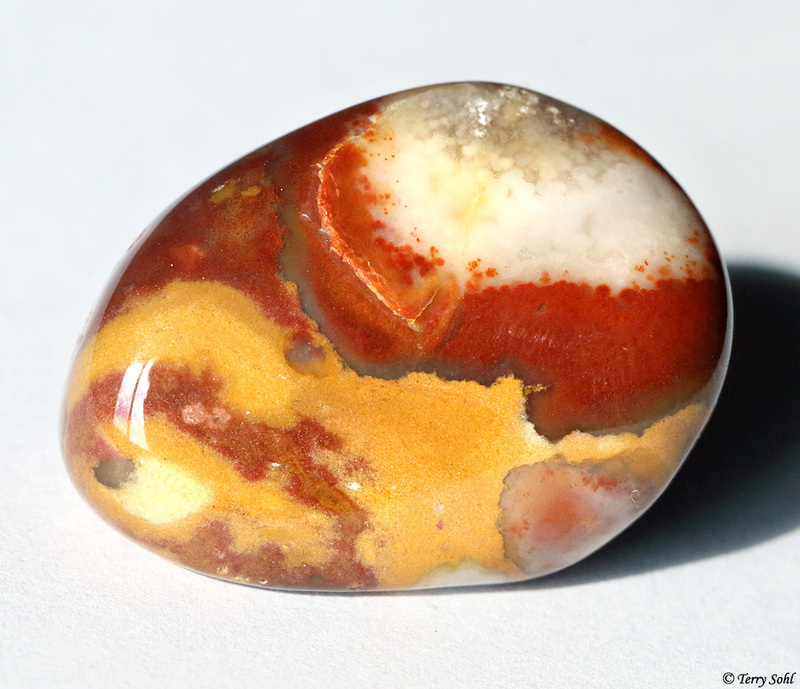 Once the little eyed nodules wear down in the polishing process, you can get some truly gorgeous colors. Best of all, bubblegums take a VERY good polish and shine. 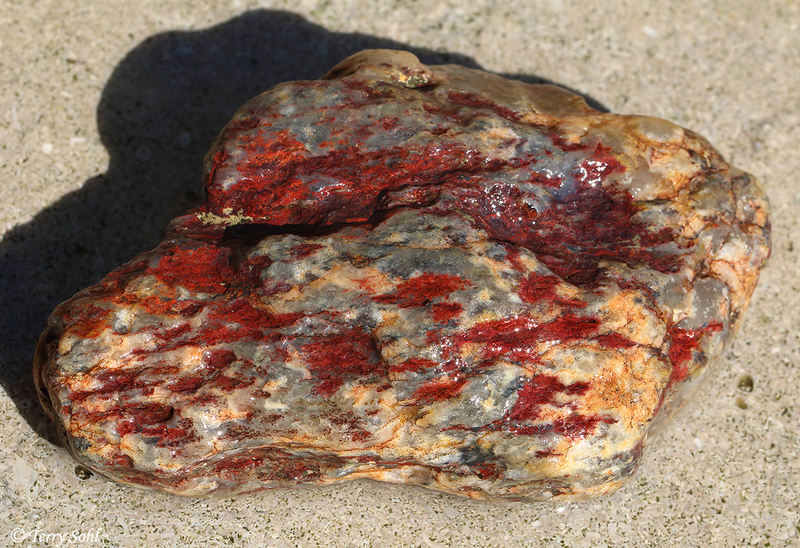 This is the most common form of petrified wood that I’ve found on the Grasslands. You do have to be careful polishing, as sometimes the wood pattern is only on the exterior of the piece and may wear away if you polish too much. If you’re careful though, you can get a beautifully polished piece such as this. This is small piece, the diameter of a penny. 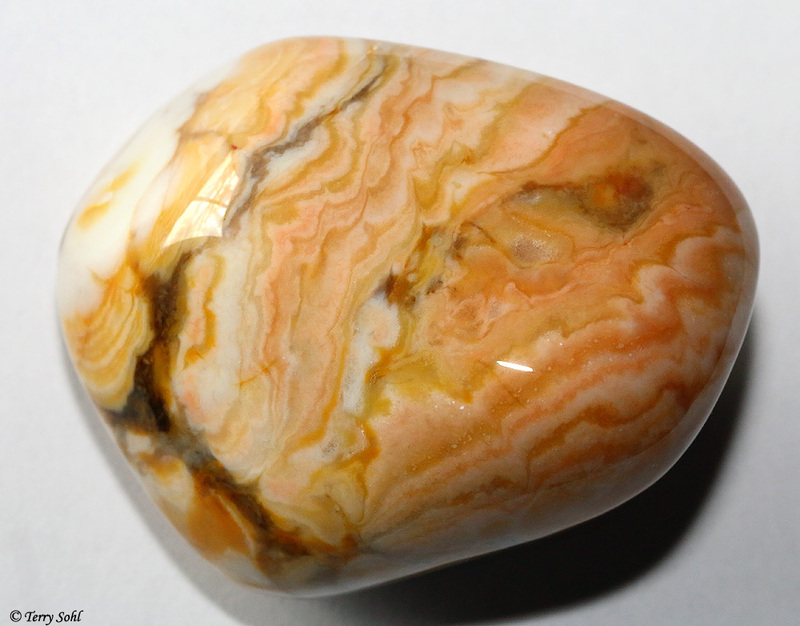 But HOLY COW do some polished bubblegum agates look wonderful when polished. In this case, the entire outside of the bubblegum was black when I first put it in the polisher. Many times that black wears completely off, often leaving the typical red and cream colors of bubblegums found here. On this one, I stopped the rough polish while it still had some black “eyes”. Gorgeous little piece. 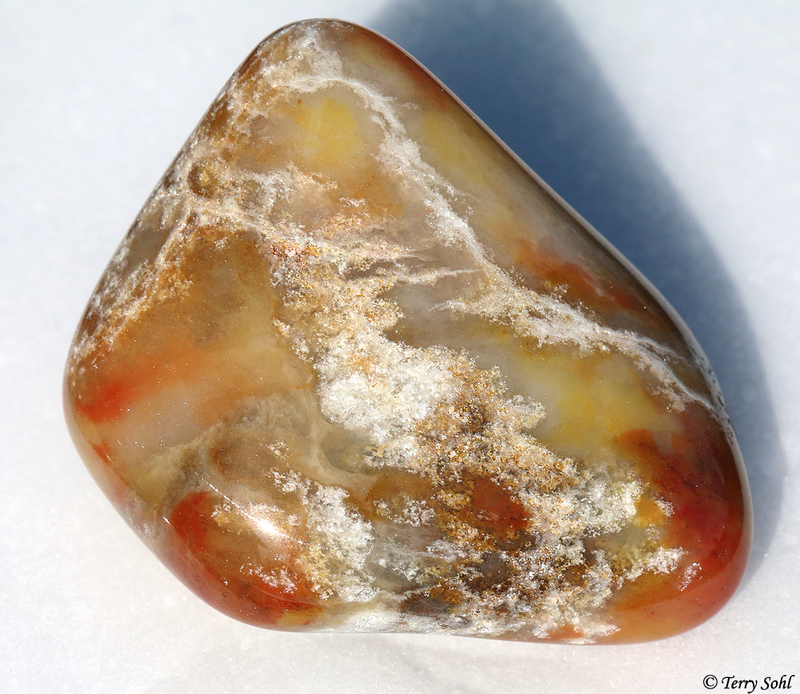 There are pieces of quartz on the Buffalo Gap National Grasslands of many different colors. This smoky gray piece polished up beautifully, particularly after I left it in the rough-polish stage for many weeks to get the “egg” shape. I don’t know what to call this piece, but it’s freakin’ gorgeous! 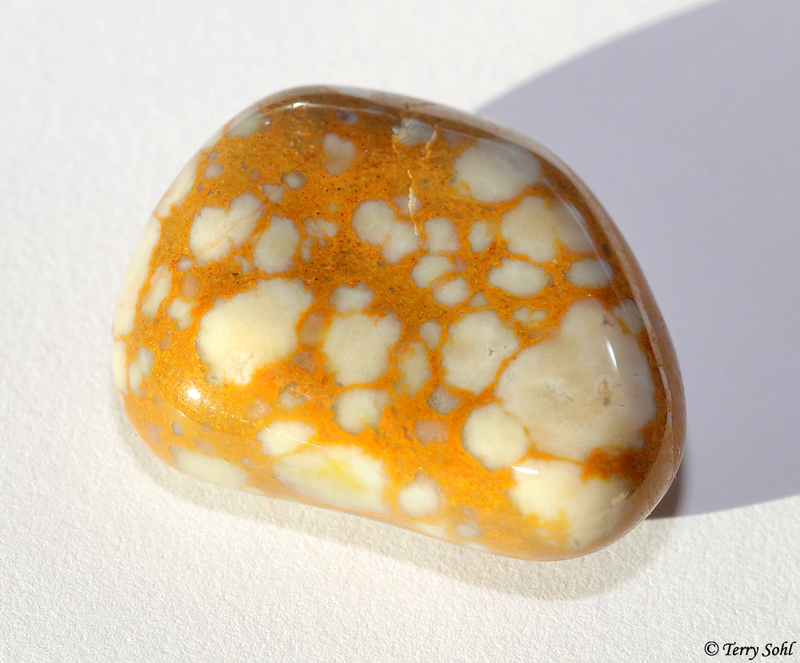 It’s pretty much one-of-a-kind for pieces I’ve found on the grasslands. 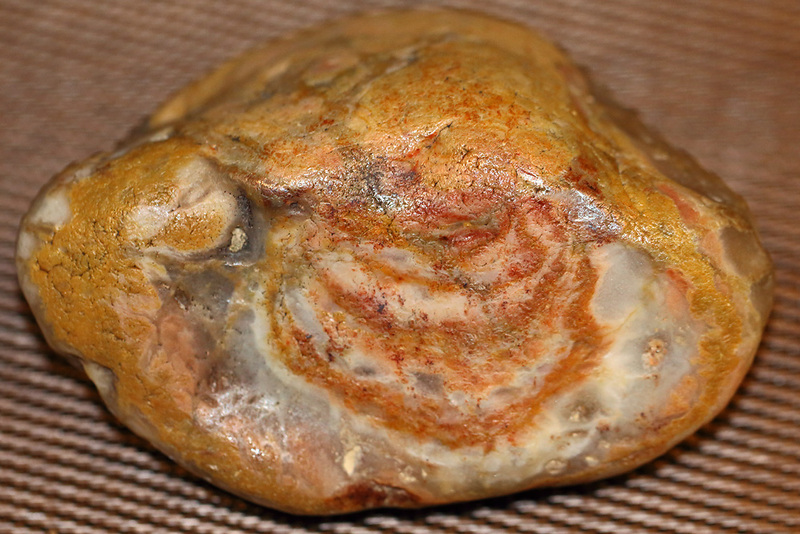 Most of the prairie and bubblegum agates you find have some form of banding. Many have some very fine bands. 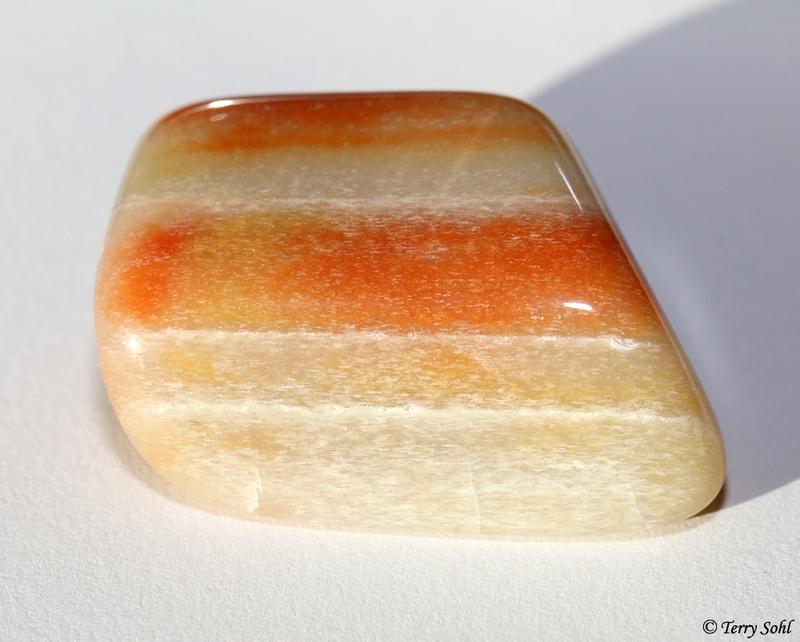 But this piece has more “layers” of thin banding than most pieces, and it has some incredibly beautiful colors as well. It’s got an unusual shape, and I was tempted to keep it in the rough polish phase for several more weeks to get a more rounded shape. Given how beautiful it is, however, I didn’t want to take a chance it might break apart, so did the final polishing on this unusual shape. 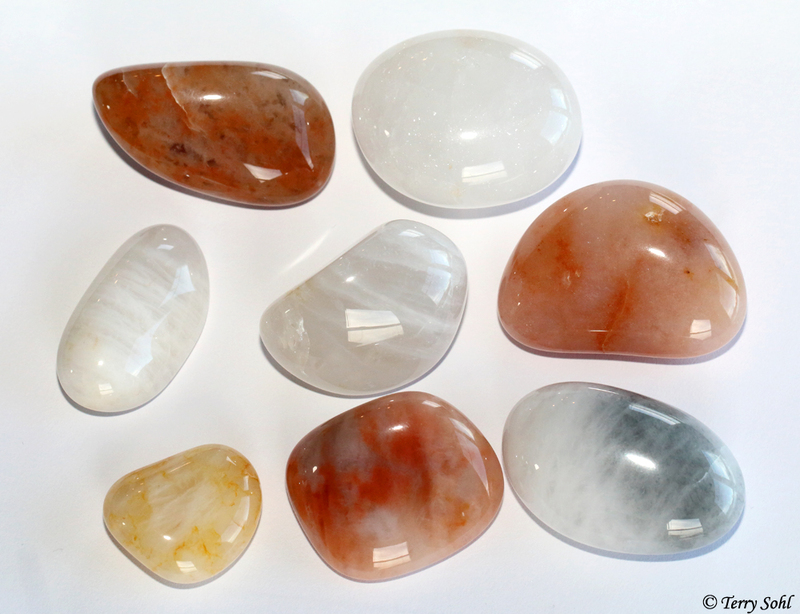 Some of the polished quartz pieces from this batch. Clear, White, and pinkish tones are the colors you find the most, but there are others as well. ALL polish up beautifully. 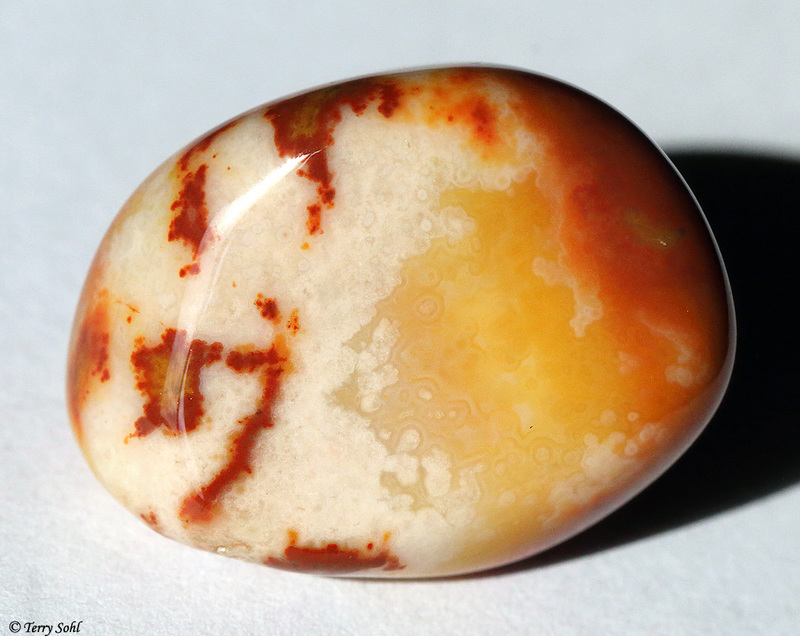 Another agate where the pattern underneath really wasn’t revealed until after many weeks of polishing. It’s not as obvious as the Fairburn above, but there are some hints of a Fairburn-type pattern. 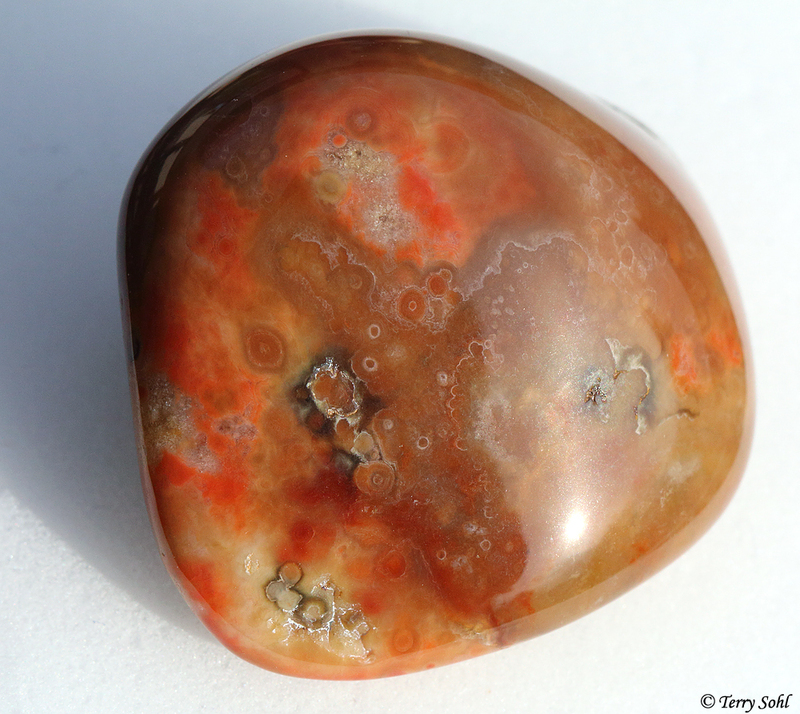 I know there’s a kind of agate called “mossy agate”. I’m not sure that’s what this is, but it’s such an unusual piece. 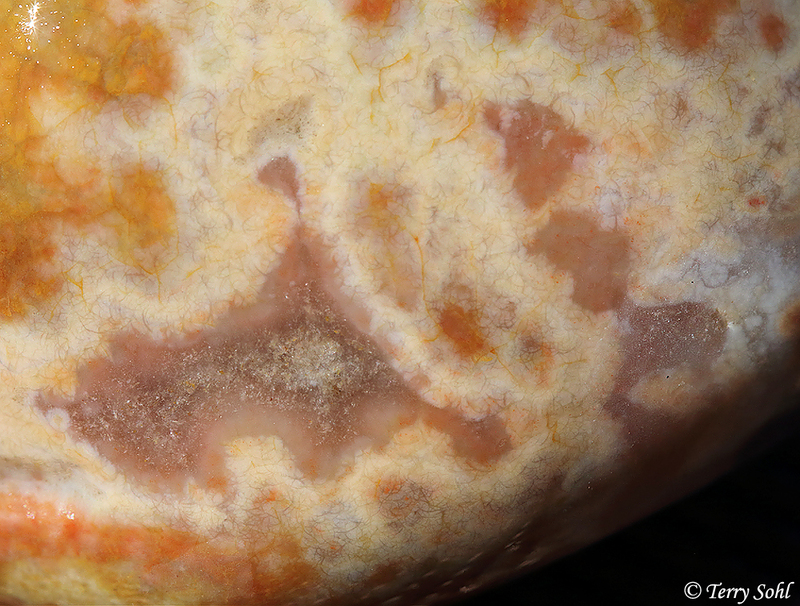 The pattern itself is quite unusual for agates I’ve found, but so is the mossy, orangish patterns that fill in the gaps between the white blobs. Cool one-of-a-kind piece in my collection. From an unusual piece above, to a pretty common piece. 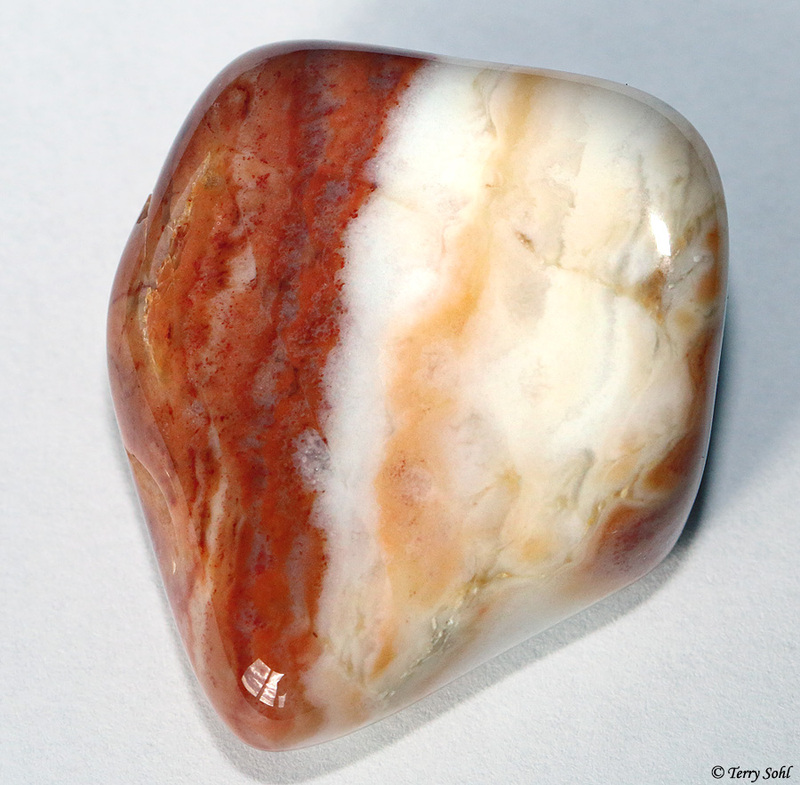 While creamy and white banded prairie agates are the most common color form I seem to find, I also often find ones like this, with blackish bands in a creamy matrix. The grayish petrified wood near the top of this post is easy to find, but you do also sometimes find more colorful pieces. 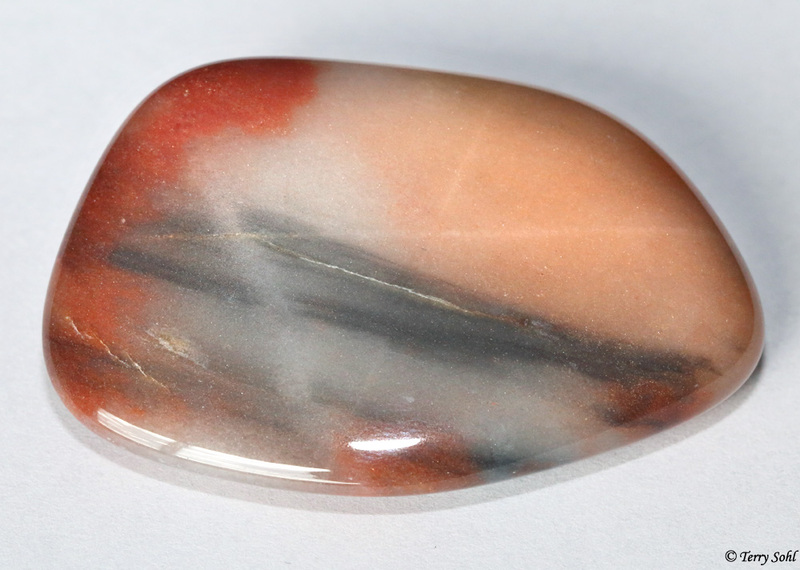 This one has some wonderful reddish tones, as well as a bluish streak on the back side. I kept putting this pieces back through the rough-tumbling phase, trying to wear a bit more off of this side to try to reveal more of the different colors. But alas, it kept getting smaller and smaller, but with the same color pattern. 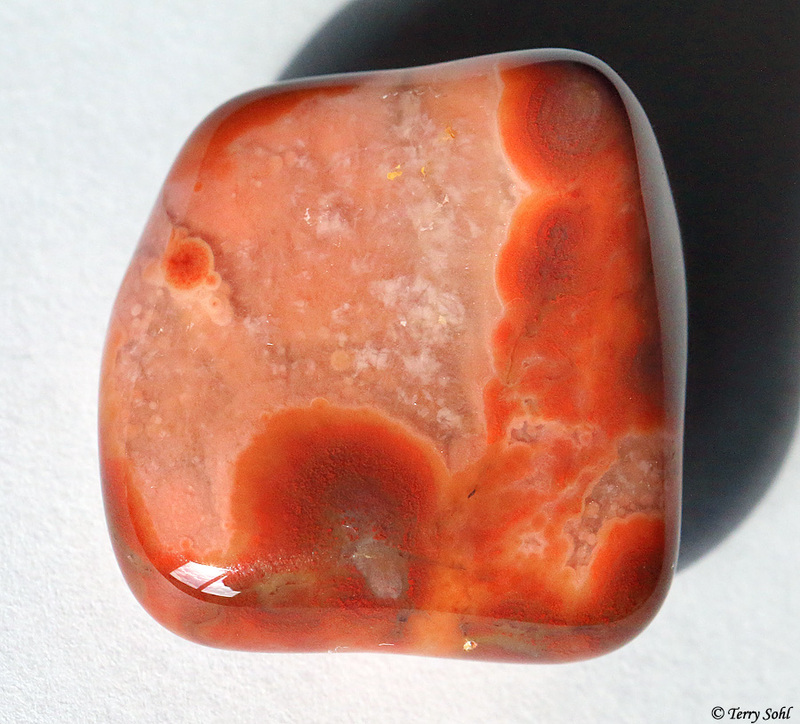 Another great little bubblegum agate. 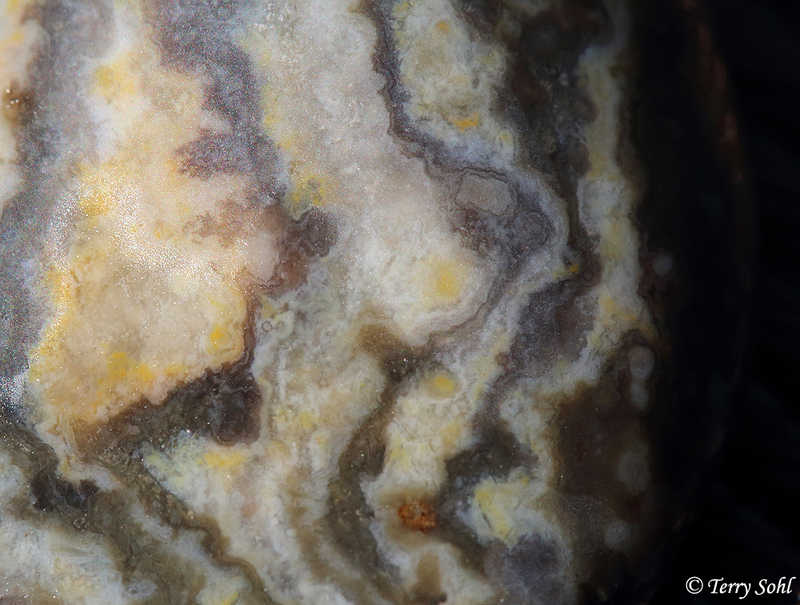 Some of these pieces end up showing many little eyes once polished, but many also often show some gorgeous banding underneath. 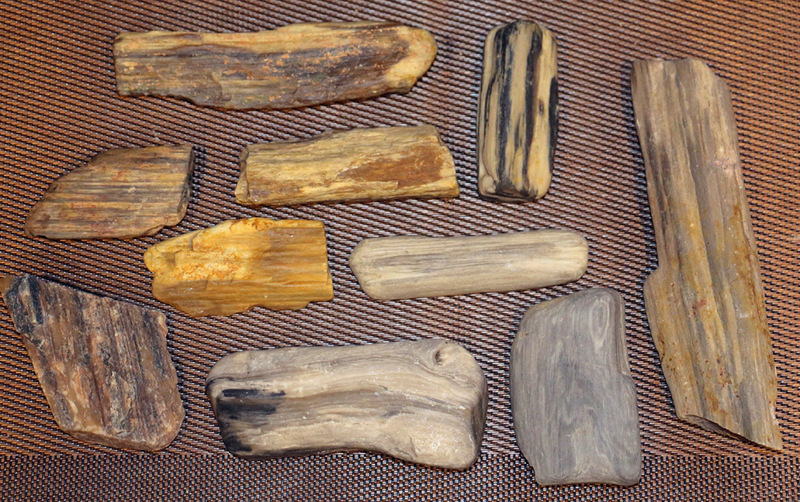 Some of the petrified wood in this batch, showing the variety of forms you can find on the Buffalo Gap National Grasslands. 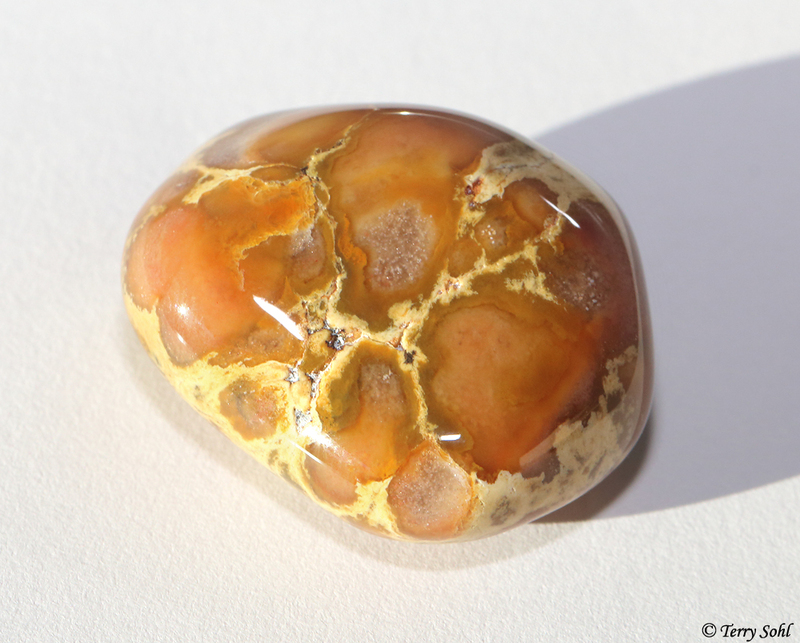 I’m not sure what you call this…a prairie agate, or some kind of conglomerate. 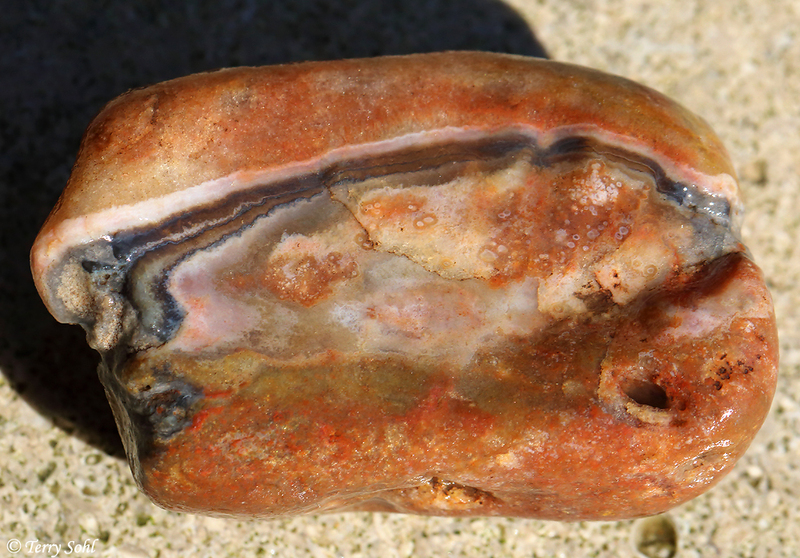 Prairie agates here seem to often be banded, but some too do look like a mish-mash of fragments that have been found together. 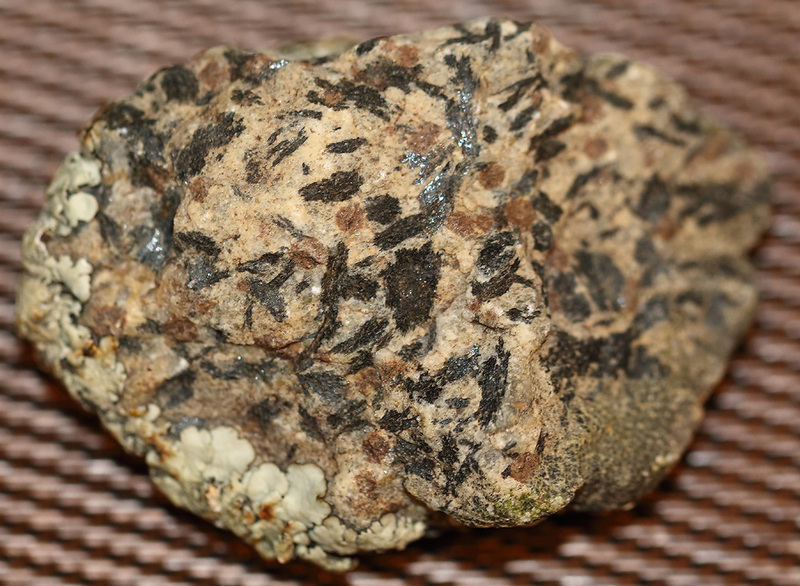 The conglomerate-looking ones really can have some cool patterns once polished. 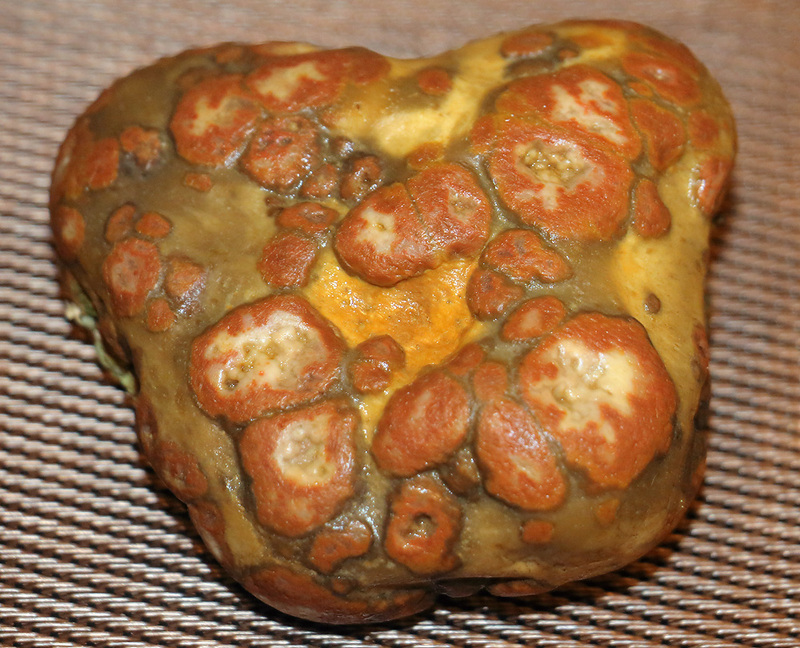 Speaking of funky conglomerate-like stones…this one has some very fine patterns that are pretty unusual compared to other pieces I’ve found. 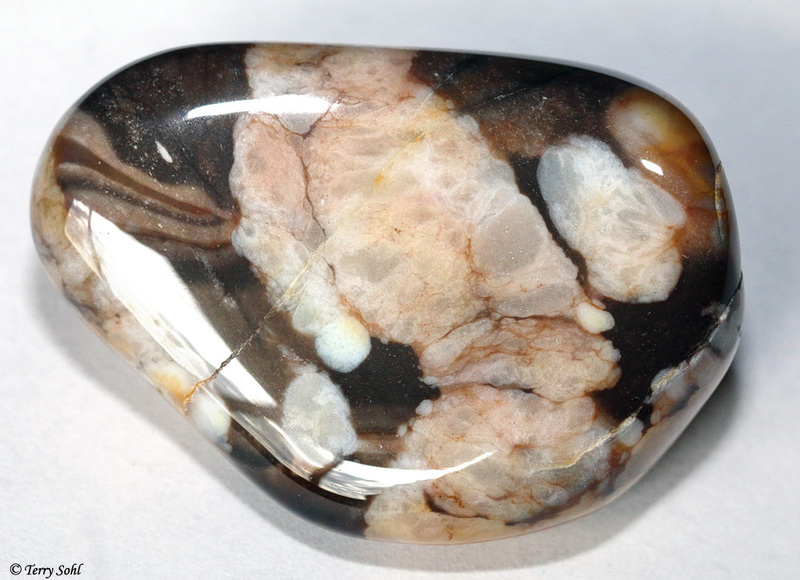 The biggest piece in this batch, an almost tennis-ball-sized chunk of quartz with an cool brownish-orange tone intermixed throughout. 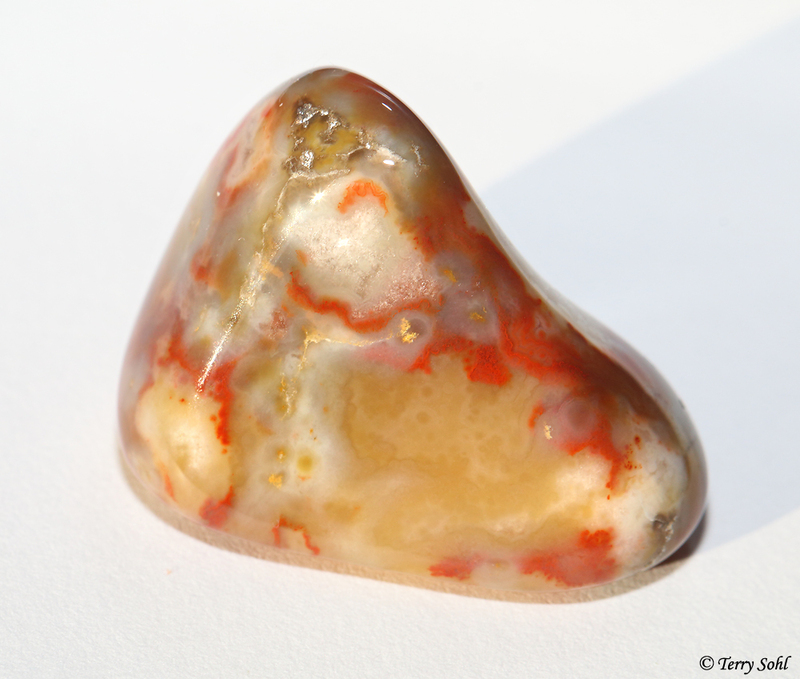 Sometimes bubblegum agates turn out like this when polished, with just the “eyes” remaining. Size doesn’t matter! 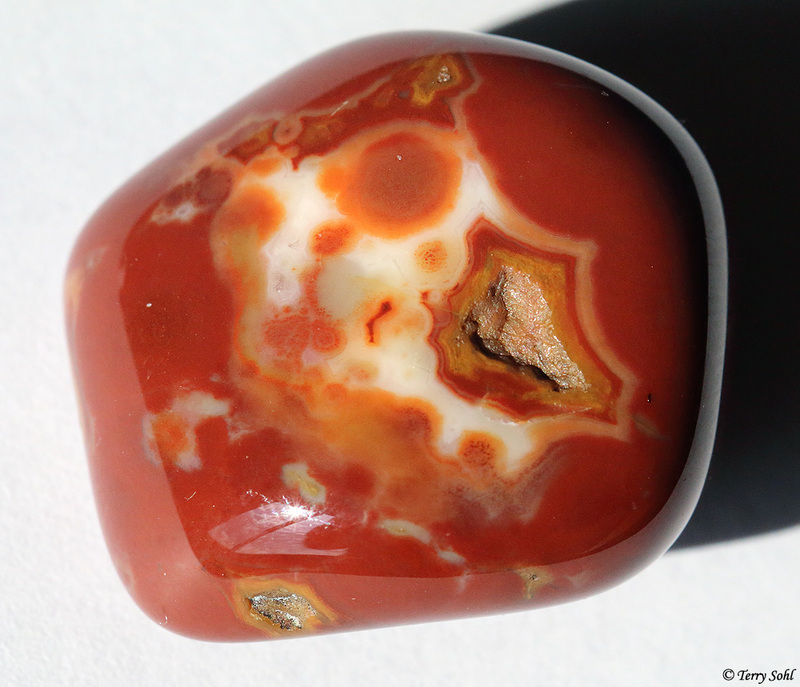 Even the small little pieces have some gorgeous patterns once you photograph them in macro mode. 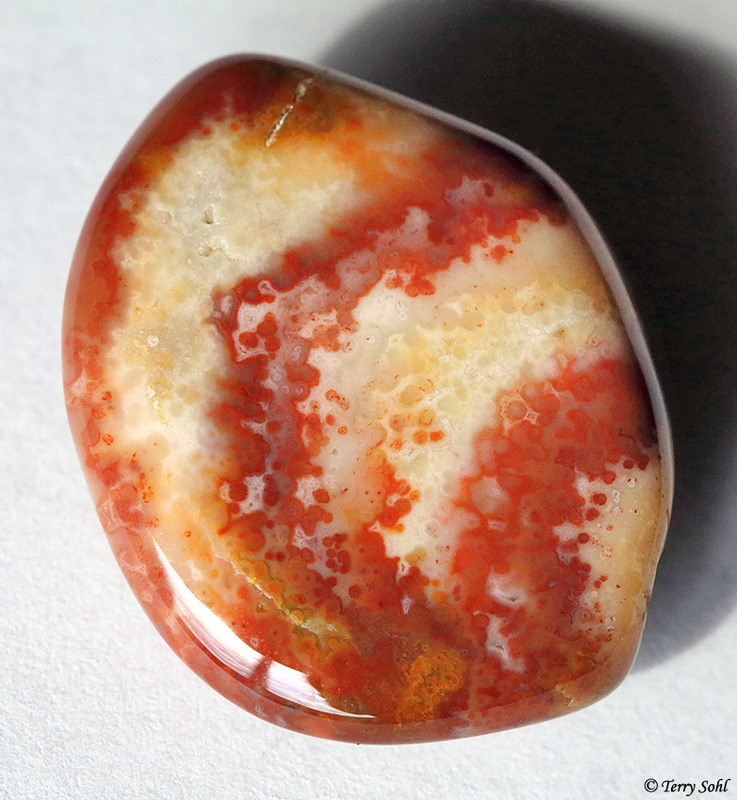 I call this “red splotch agate”. Given I’m still new at this and have no idea of what to really call it. 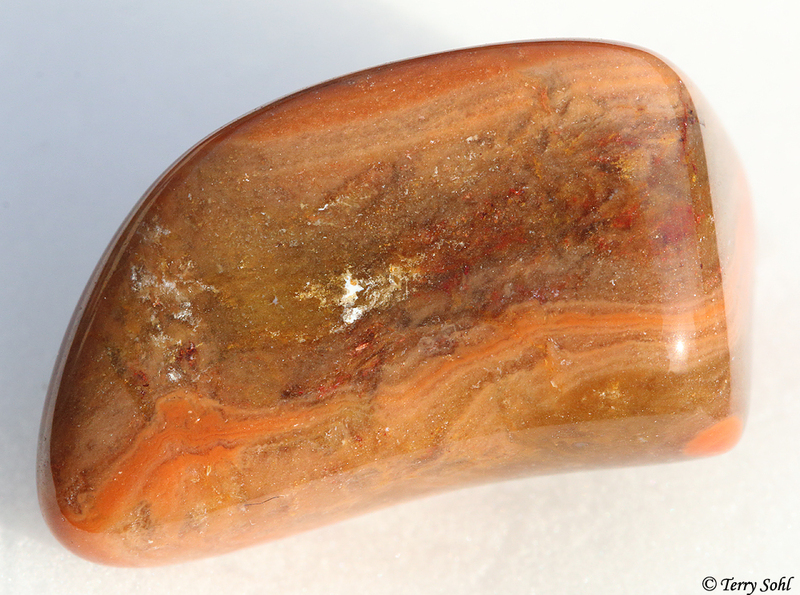 Some of the prairie agates have reddish tones, but this one has more red throughout than most that I find. 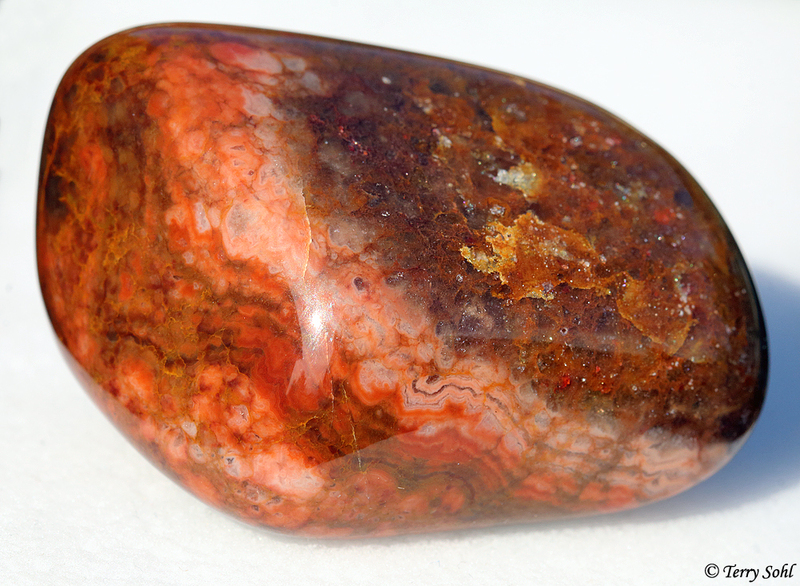 Another of the reddish quartz pieces. 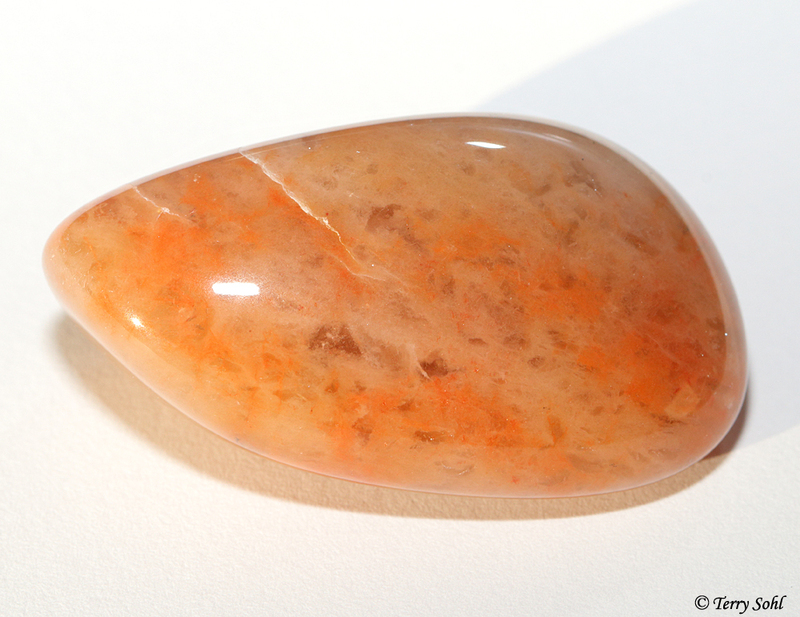 And…one last one, another polished piece of quartz. 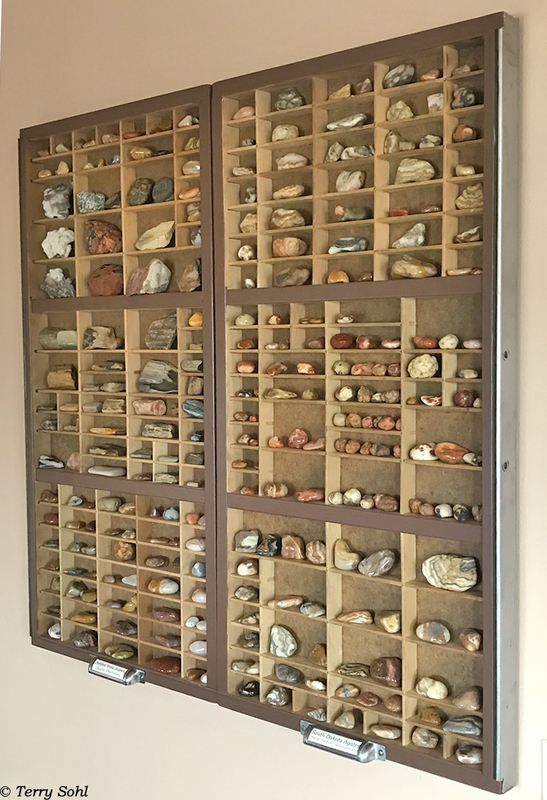 South Dakota Rockhounding Display – Complete!! The age-old question has been answered! 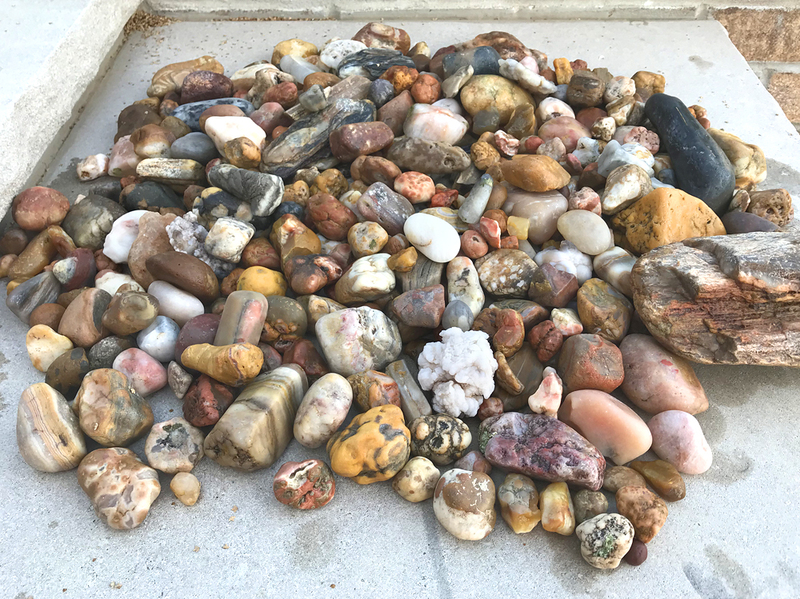 The question (primarily from my wife)…”What are you going to do with all of those rocks?” Minor detail, something I hadn’t thought about much since my son and I started rockhounding this summer! But given the growing collection in the basement, it was time to figure out how to display some of our goodies. The finished printer’s trays, sanded and refinished on the wider cross pieces, but simply cleaned up and left as-is for the individual compartments themselves. I used a brown enamel paint on the wide pieces, but simply sanded off the old paint and expose the metal faceplate on each drawer. The most satisfying aspect of the collection shown here? Every single piece was hand-collected by my son and I, all from right here in South Dakota! An oblique view, one that shows the bare metal I left on both original drawers. For each of the two printer’s trays, I cleaned up the original drawer pull, and repurposed them as labels. 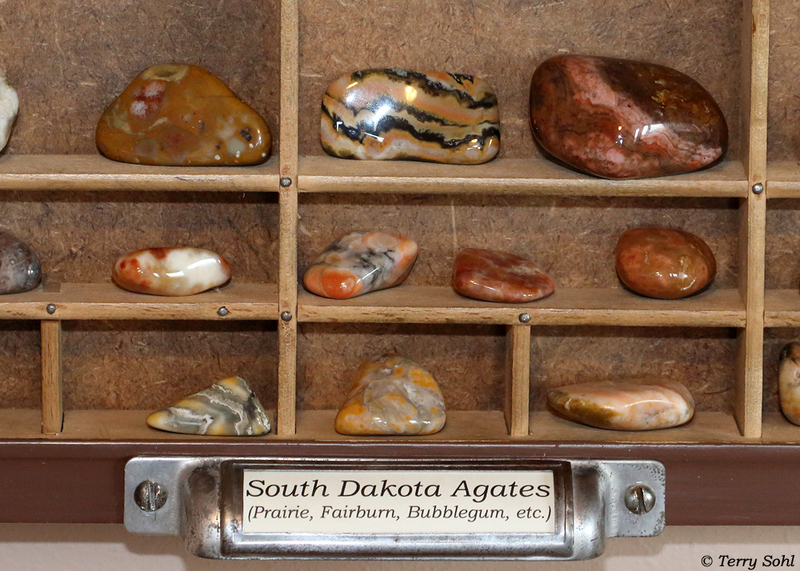 The right side is rightly labeled “South Dakota Agates”, as every piece on this side are prairie, Fairburn, bubblegum, or other agates, all collected from the Buffalo Gap National Grasslands. The original drawer pull and label on the left piece. 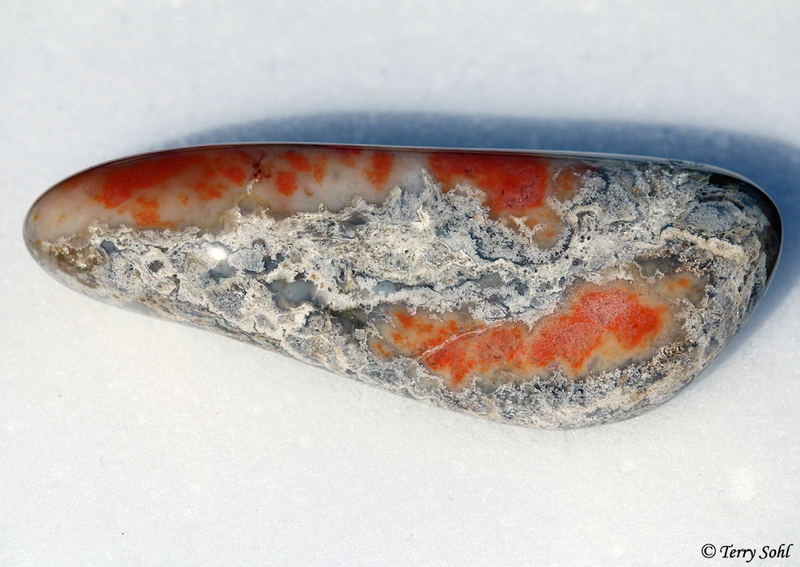 This side is more of a “mish-mash” of material, with a lot of petrified wood, quartz, chalcedony, jaspers, and other pieces. Again, all collected from right here in South Dakota! One of the six major compartments across the two trays. 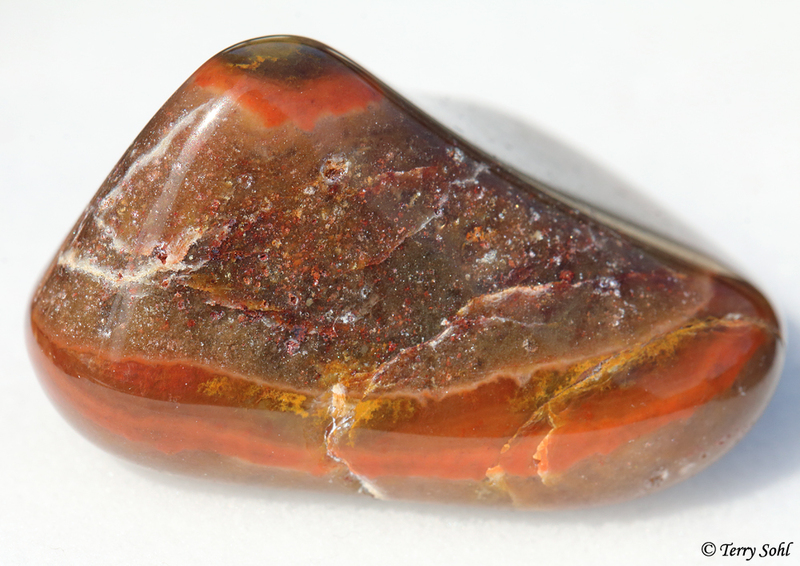 This one is devoted to prairie agates, and the handful of Fairburn agates we have so far. We haven’t found many Fairburns as of yet, but the one on the right here is the favorite of ANY piece we’ve found so far. 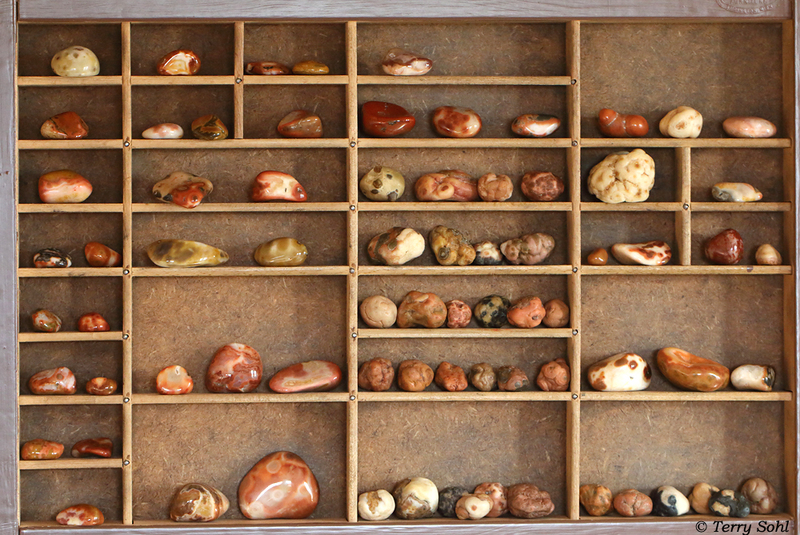 One of the six compartments devoted to bubblegum agates. 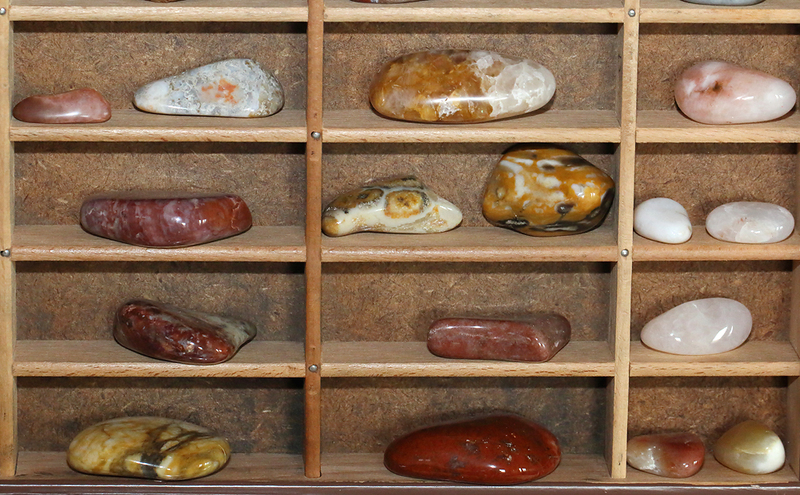 Some are tumbled and polished, most here have not been polished yet. I like the look of the little bubblegums though, and probably won’t polish most of these. 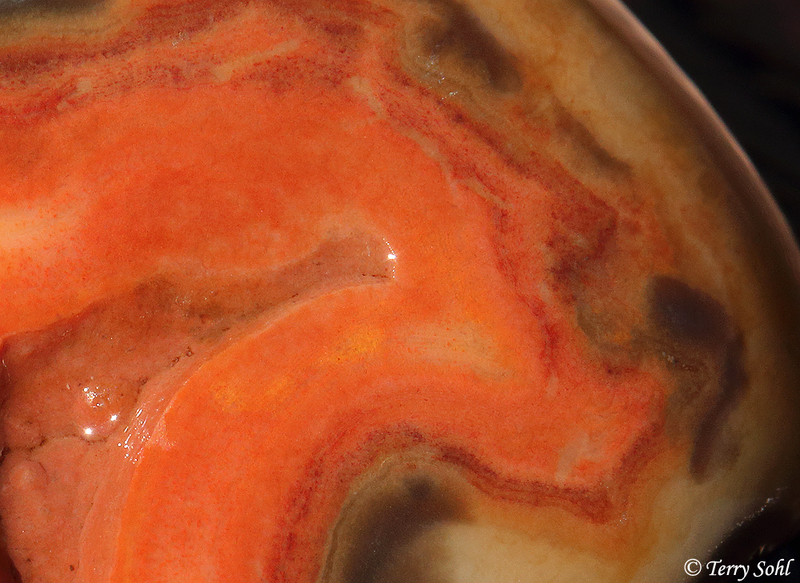 The “eyes” of the bubblegum agates give them a great look then when you do polish. 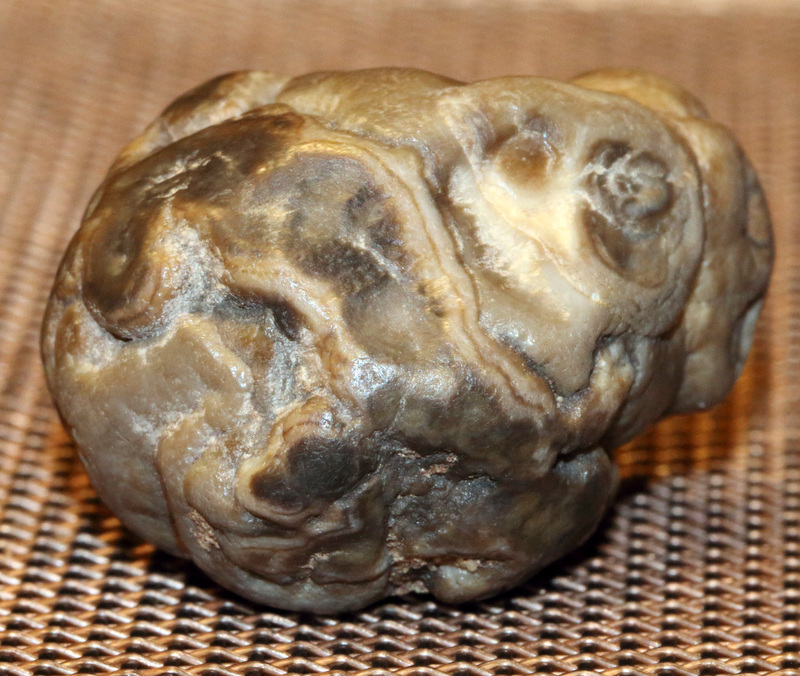 A closer view of some of the “raw”, untumbled bubblegum agates. You can see why they are well named! They do often look like chewed up pieces of bubblegum. 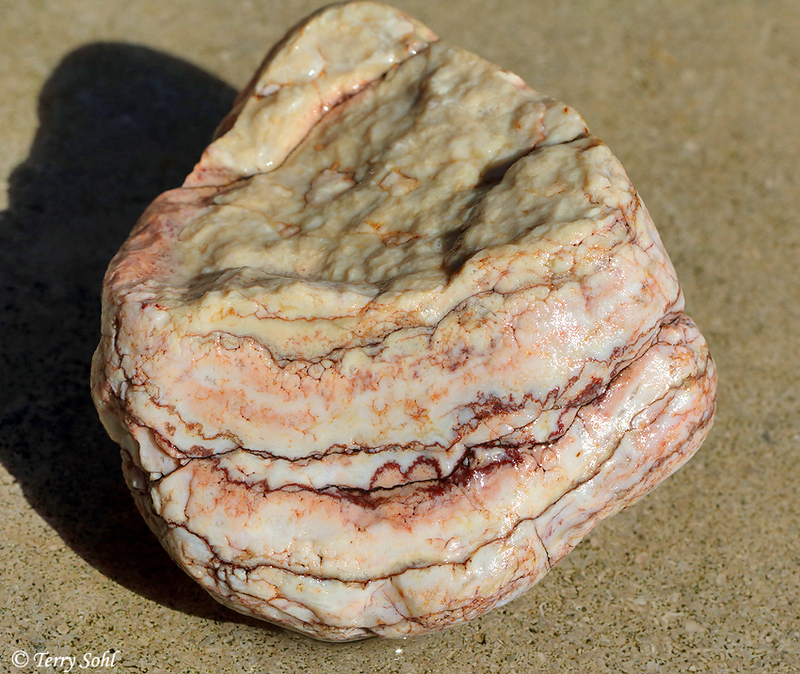 The 2nd most common find for us on the Buffalo Gap National Grasslands – petrified wood. 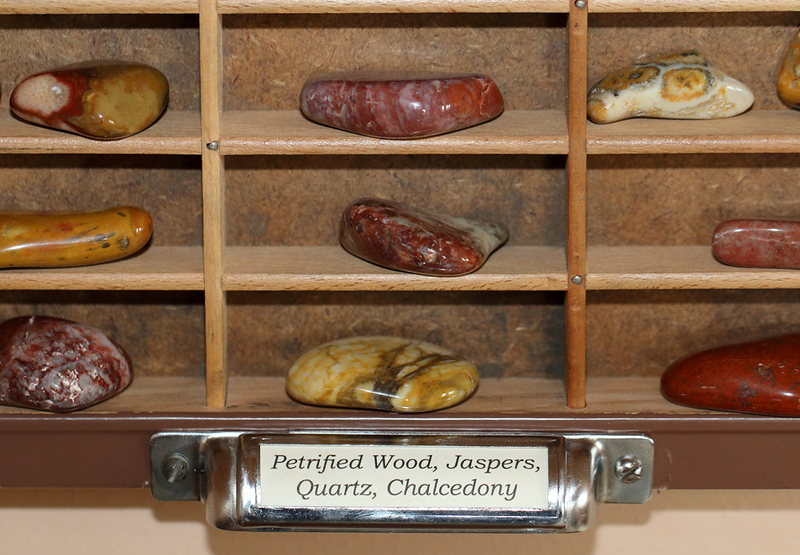 These are all petrified wood pieces. 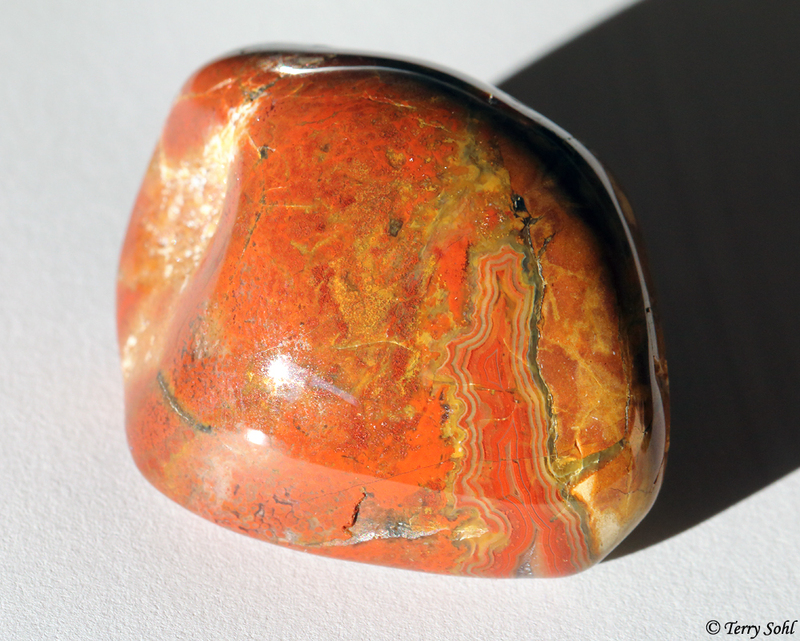 Most you find are the grayish or tan color, but there are also some other beautiful colors and patterns you can find. Most of these have not been tumble polished. 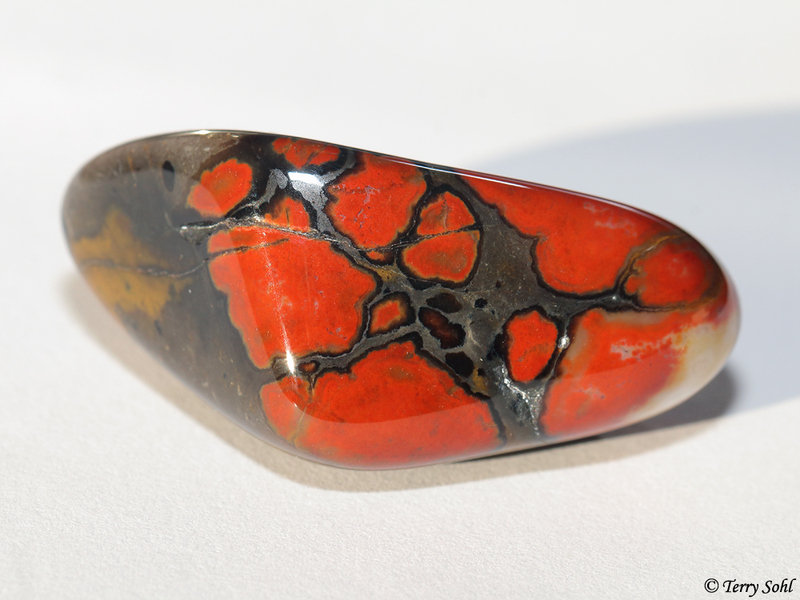 It’s not just agates and petrified wood on the Grasslands! 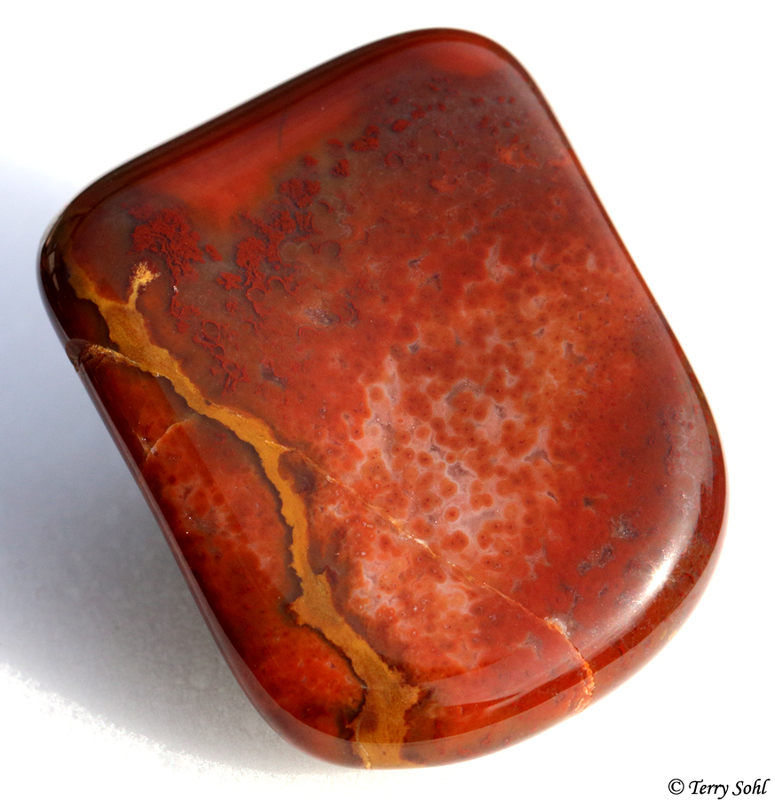 There are other forms of chalcedony, and a huge variety of other rocks as well. 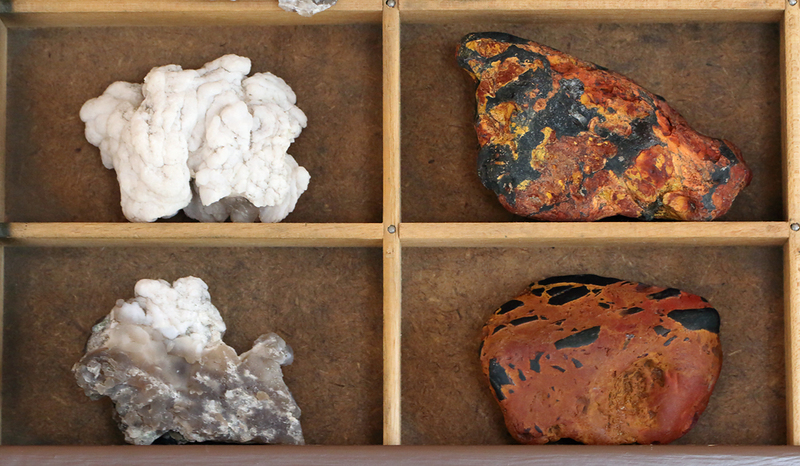 I’ve been told those on the right (particularly the bottom right) are chert, in a limestone matrix. 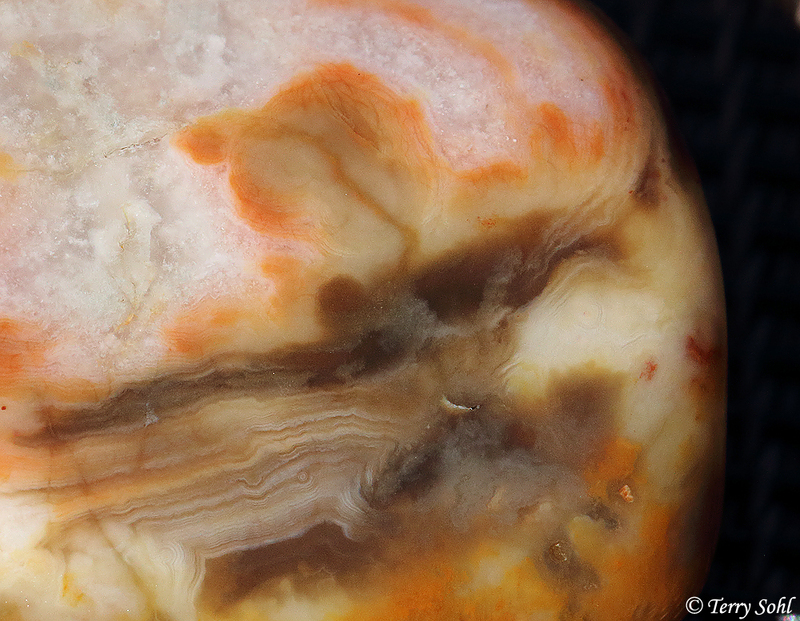 A closer look at some miscellaneous (prairie) agates. There’s quite the variety of colors and patterns that you can find. All here are polished, except the one in the upper right. 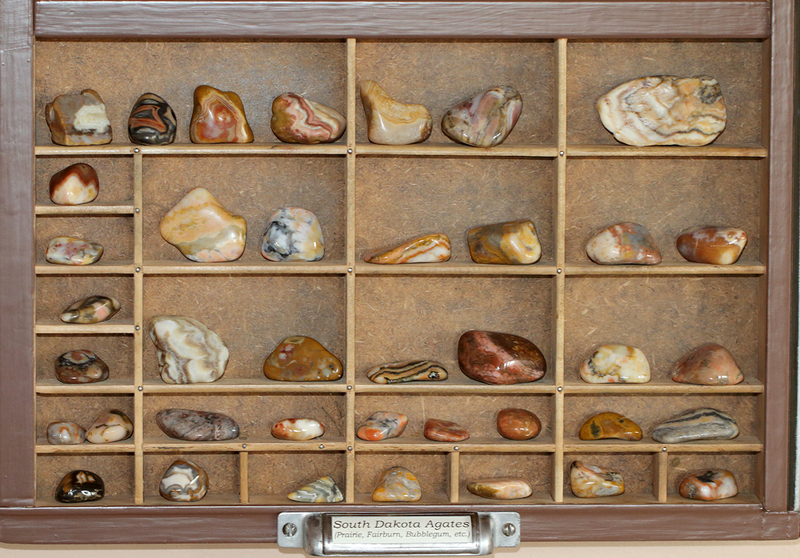 A few miscellaneous jasper, quartz, and agate. The only downside to the use of the printer’s trays…some of the compartments are relatively big, but the depth is quite shallow. Bigger pieces thus won’t work. I haven’t quite decided how I want to display them, but for now I have a table directly underneath the display, and I’ve started to put out a few big pieces. 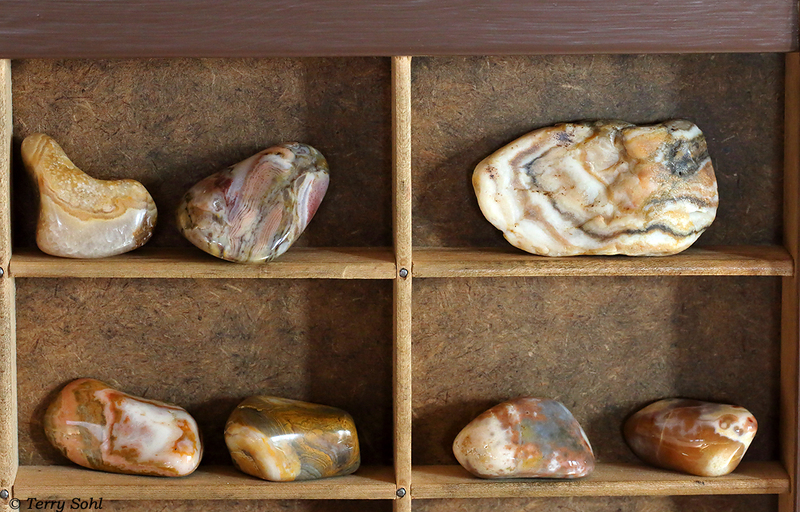 These are some big chalcedony pieces, prairie agates, and petrified wood. 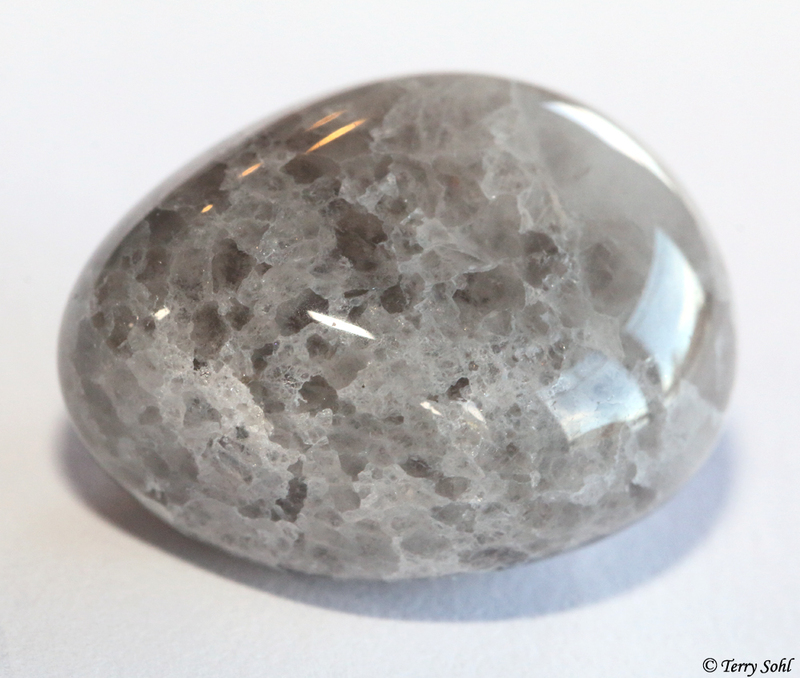 I think my favorite part of tumble polishing stones…taking them out from the first time they enter a rough polishing phase. 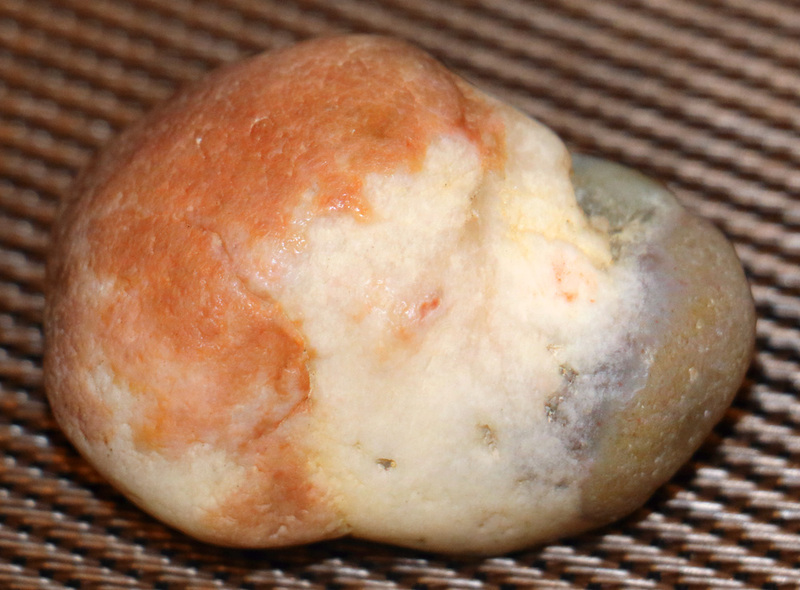 Many at that stage are odd shapes, dirty, or where I collect them, are covered with a blackish or grayish layer after being exposed to the elements. It’s when you get them out of the tumbler after the first rough polish that you start to see the hidden beauty underneath. Here’s part of a batch fresh out of the tumbler! Woo-hoo…some WONDERFUL surprise October presents! These all were collected in the same 1-square mile area on the Buffalo Gap National Grasslands. 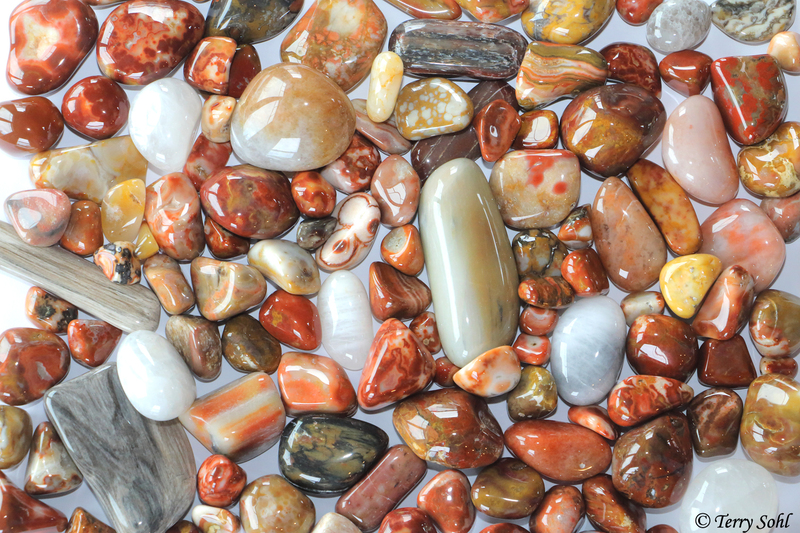 Yes…you find this incredible variety of agates and other stones, all in one spot! Rockhounding nirvana. A couple of pictures. The first shows what they look like wet, and gives a hint of their final glory. 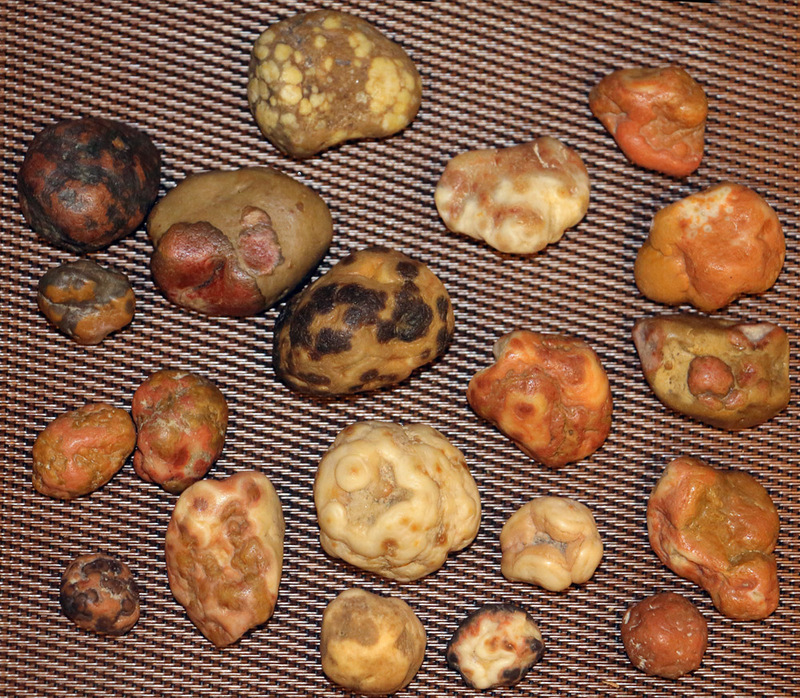 The second shows them in their dry, current stage. 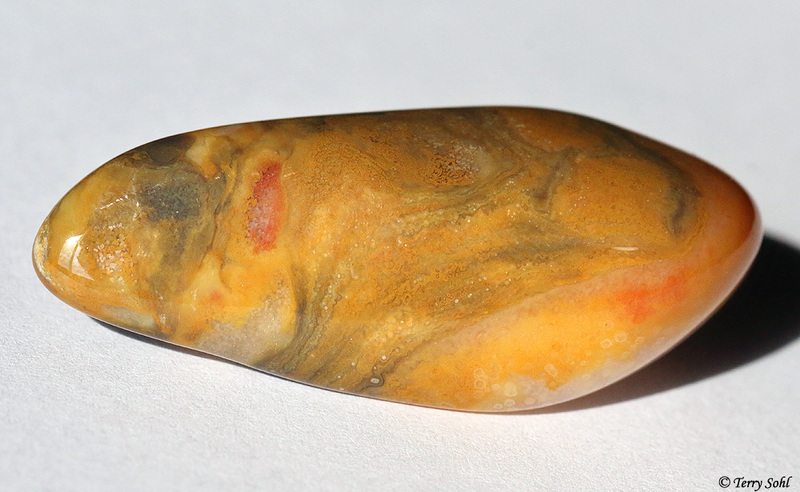 This is what the agates and jaspers look like wet, after the first tumbling stage. When wet you get a good idea of what they’ll look like when they finish polishing. 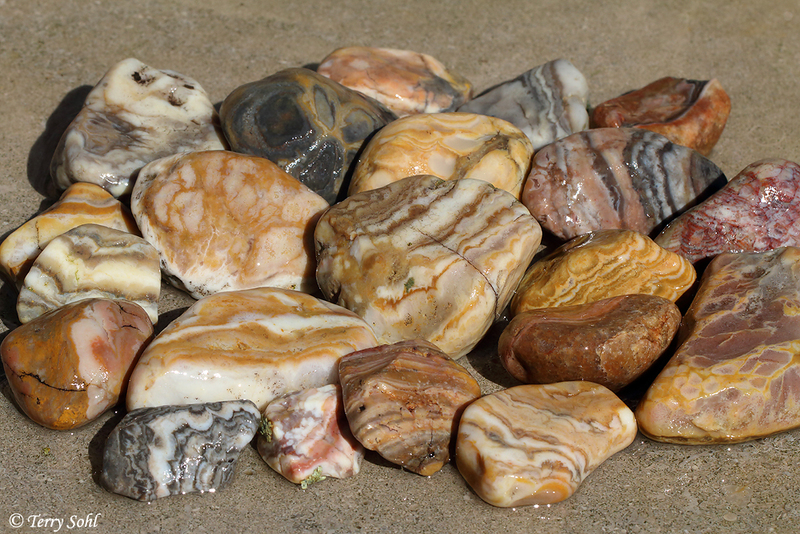 Part of a batch of South Dakota agates and jaspers, just out of the first tumbling stage. In this stage, the point is to try to shape them, get off the sharp edges, etc. They don’t even start to show any hint of that glorious, shiny luster they’ll eventually have, but even at this stage…they’re gorgeous! Three months. 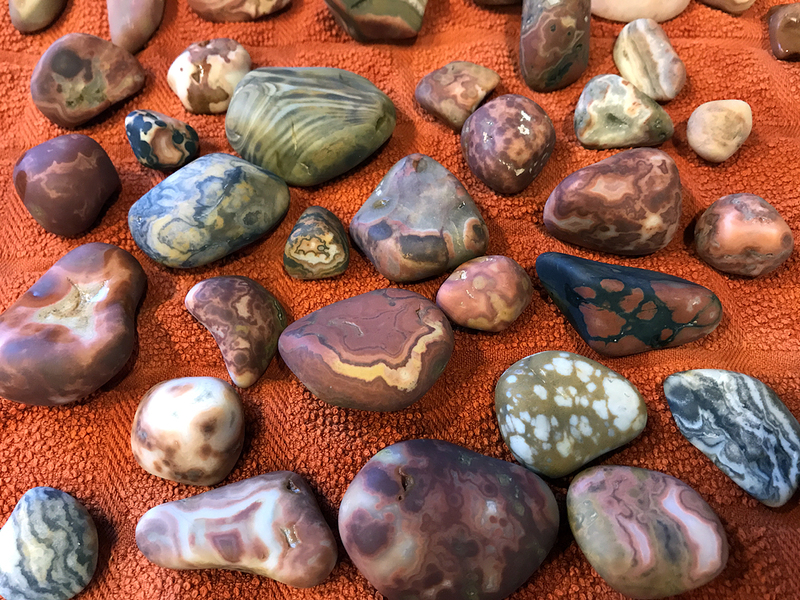 I’m learning the value of patience with my new rockhounding and tumbling hobby, as I’ve learned the stones I tumble (South Dakota agates) are very hard, and need to be tumbled for a long time to get a good polish. I’ve learned that the process thus takes about 3 months! I was doing one week for each of the four tumbling steps I do, but wasn’t getting great results until I upped that to three weeks for each step. I’m pretty thrilled with this latest batch! I would say this is my first real, high-quality batch that I’ve done. 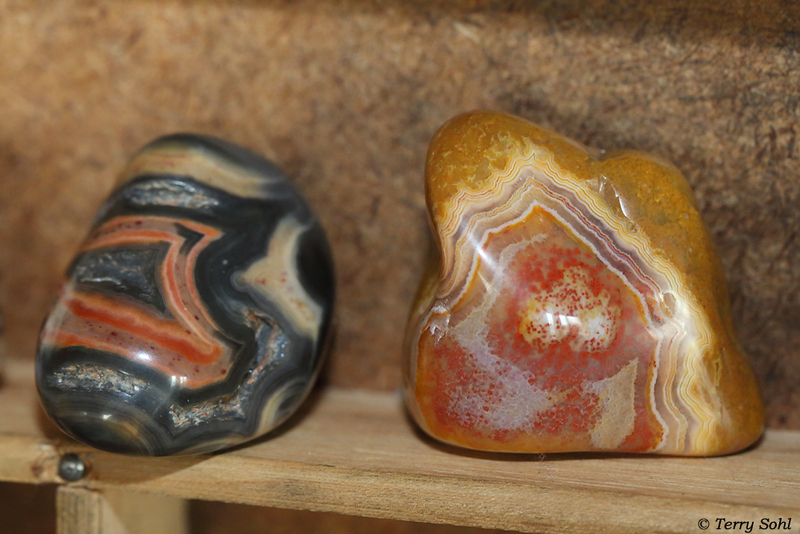 These are from my small tumbler, and thus, most of these stones are only 1″ to 1 1/2″ inches in length. 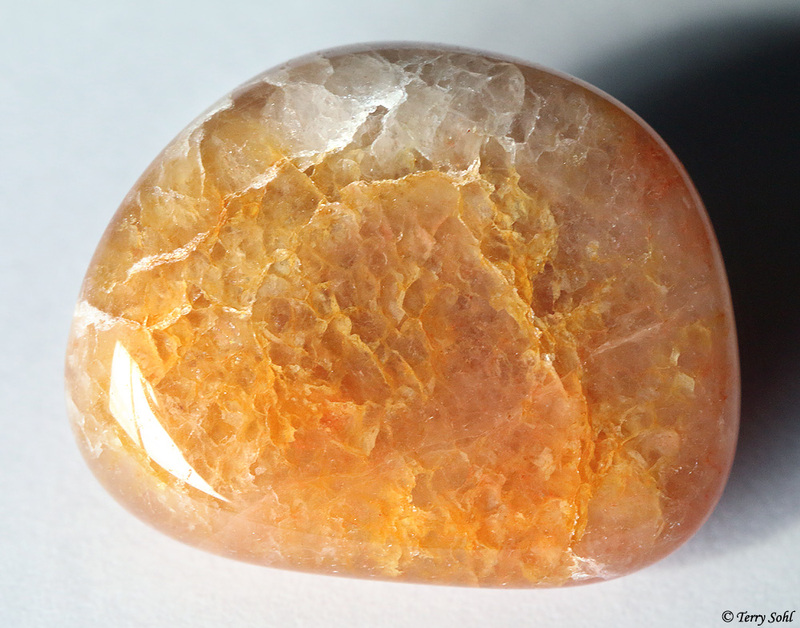 They’re beautiful even to the naked eye, but I’m finding that the use of my macro lens and a close photo really allows me to see the beauty and detail in these stones. Here’s a (large!) 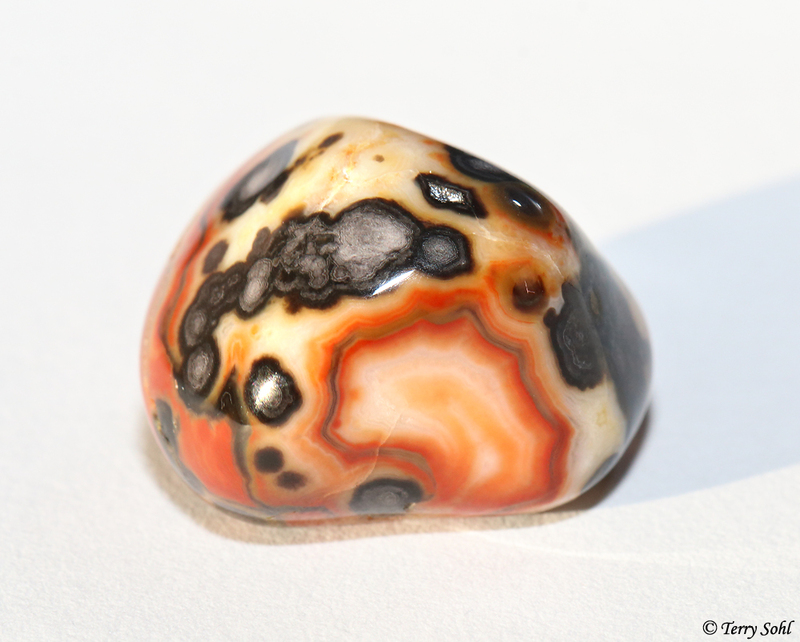 number of photos of various agates and jaspers from my latest batch. 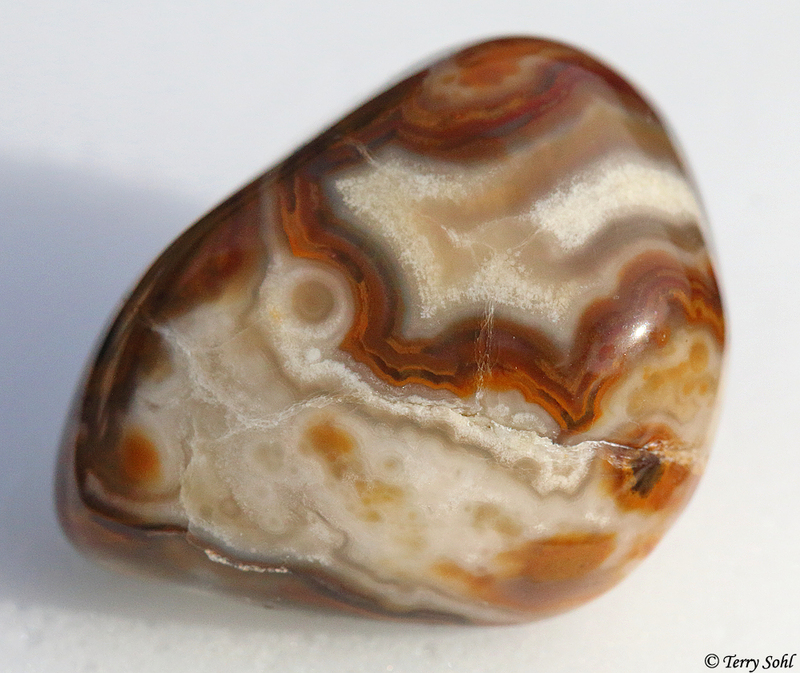 This agate had the typical, bumpy, bubbly shape of a bubblegum agate, but when I found it on the Buffalo Gap National Grasslands, it was a dull grayish-black. 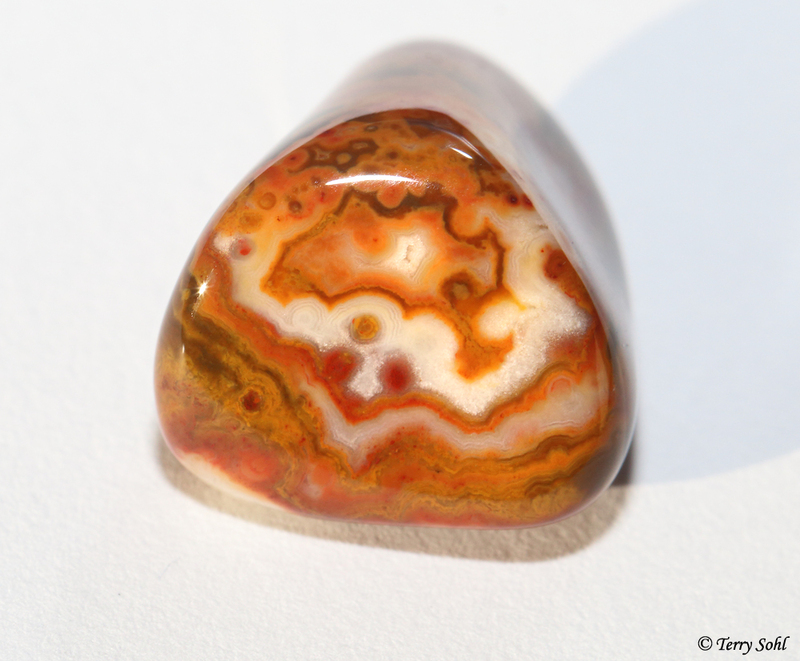 It took the better part of 4 months worth of tumbling to wear down the outer layer, exposing some of the most beautiful patterns I’ve seen on any of my agates. I’m calling this one “Crystal Dragon”. Not sure whether you’d call this a prairie, bubblegum, or other agate, but I love the swirling pattern, with the crystal/druzy “neck” on the dragon, and a little pink tongue and eye. 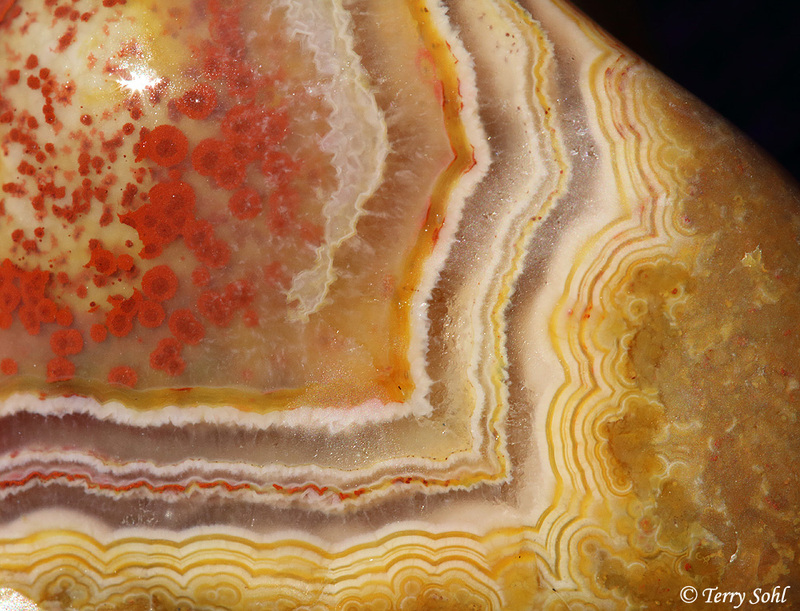 A prairie agate, showing a beautiful array of colors. 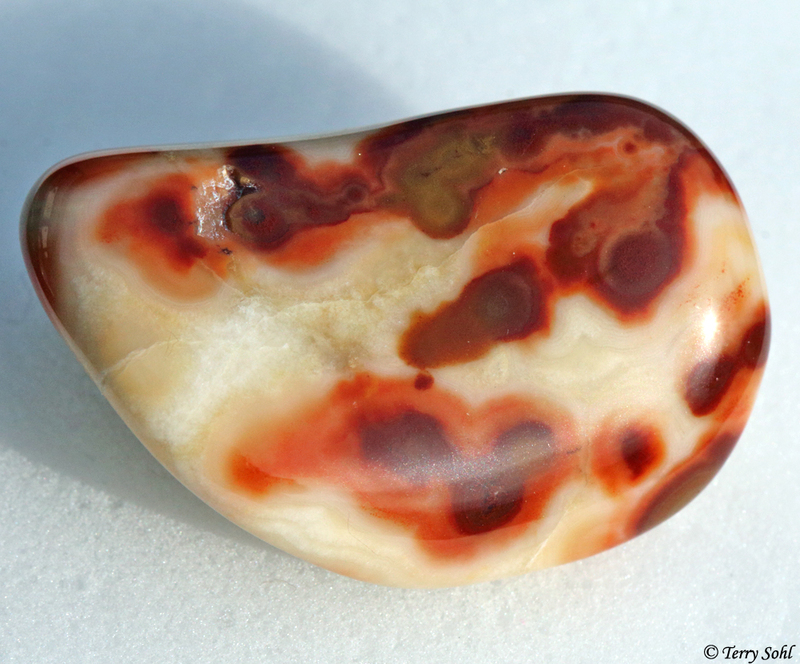 A lot of the more weathered agates on the grasslands have black parts on their exterior. 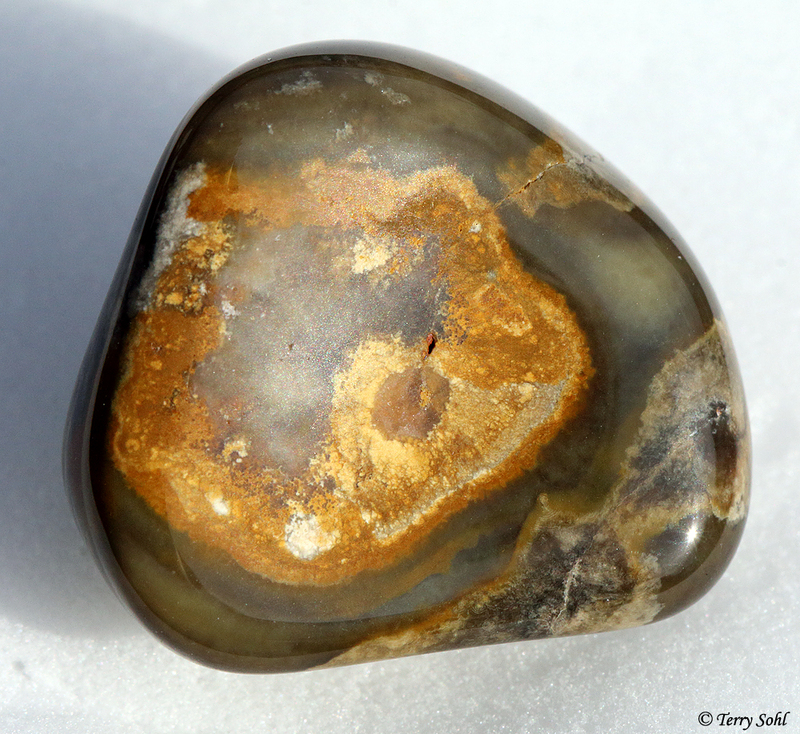 I believe that’s manganese oxide that forms when they’re exposed to the elements (at least some of the blacker agates). 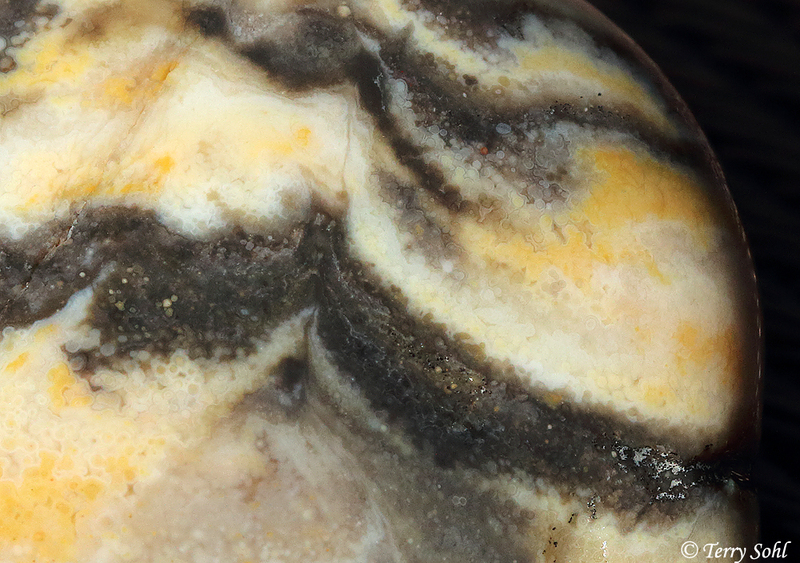 Much of the time that black disappears when you tumble, but on this prairie agate, the black was maintained in some of the bands. 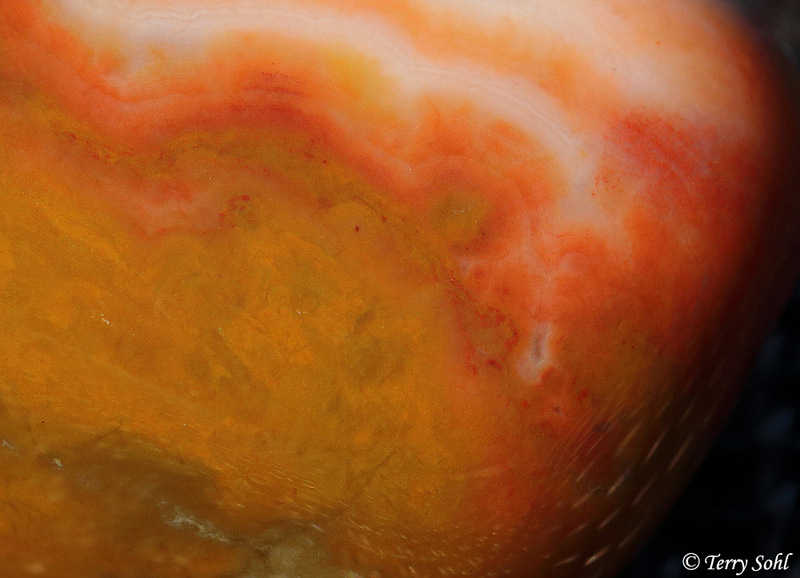 Wonderful fine detail that’s not all that noticeable to the naked eye, but is quite evident in a macro photo of this agate. 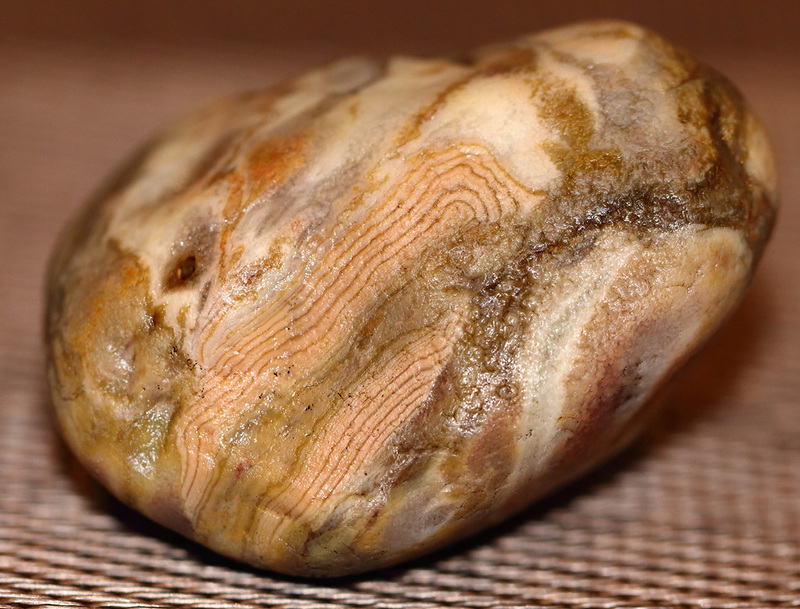 A lot of the bubblegum and prairie agates you find have a very subtle, very fine banding such as this. Very often it’s not noticeable until you tumble. 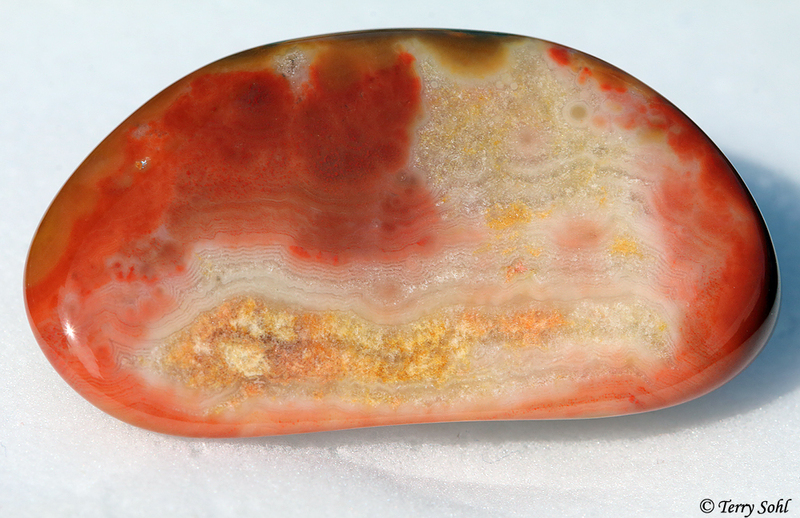 A classic bubblegum agate, a little larger than many of the agates on this page. 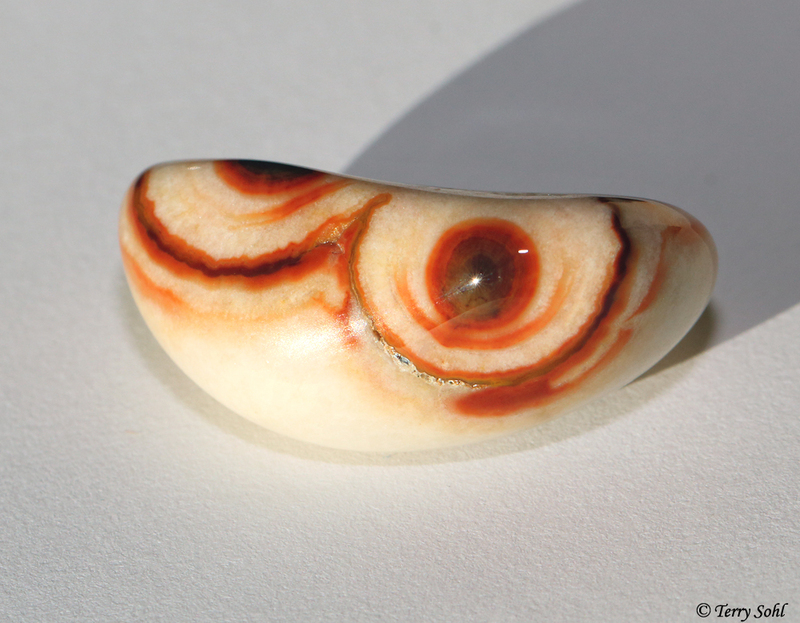 Bubblegum agates really tumble beautifully, as you generally get these beautiful agate “eyes”. 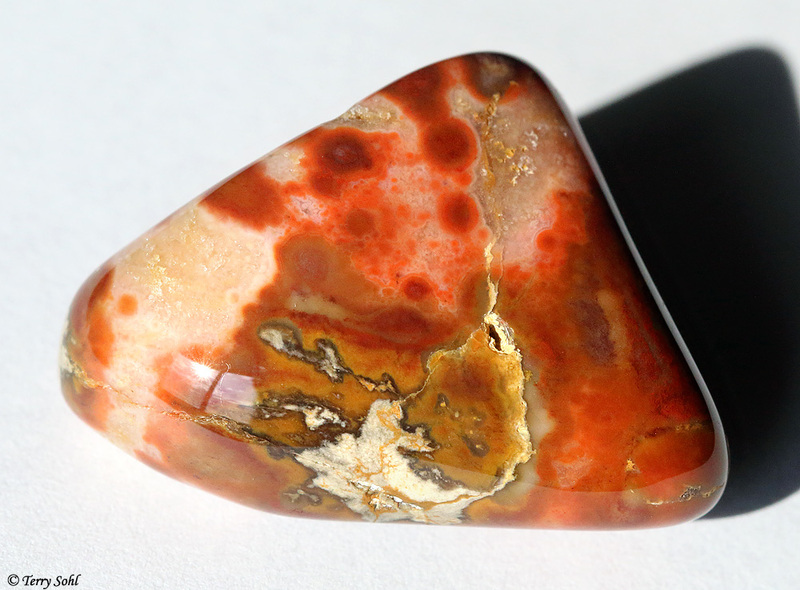 Interesting shape on this agate, with a little peak that has it’s own little cap/color pattern. 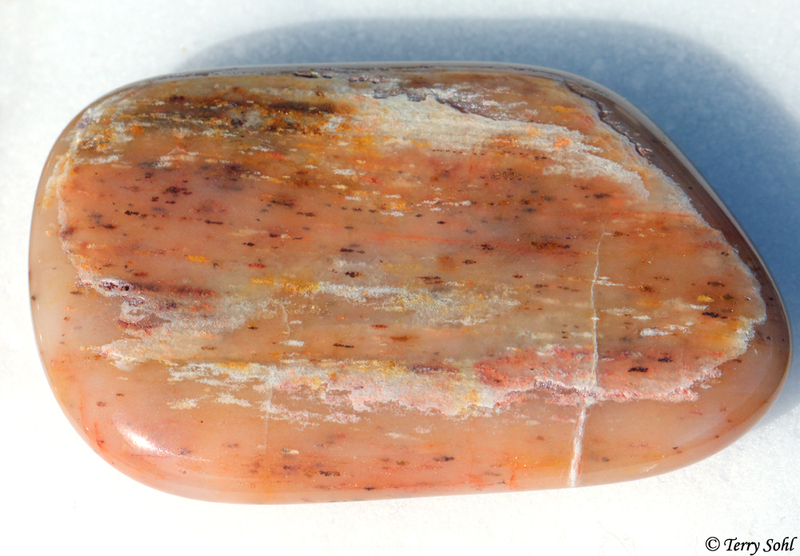 A prairie agate, with a lot of “druzy” (crystally) elements. 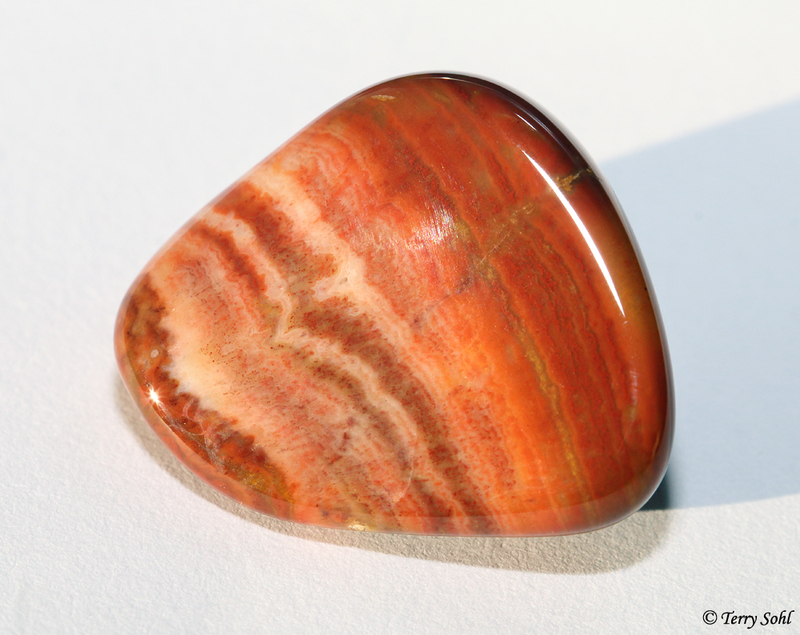 The biggest agate in this batch is also one of the most gorgeous. 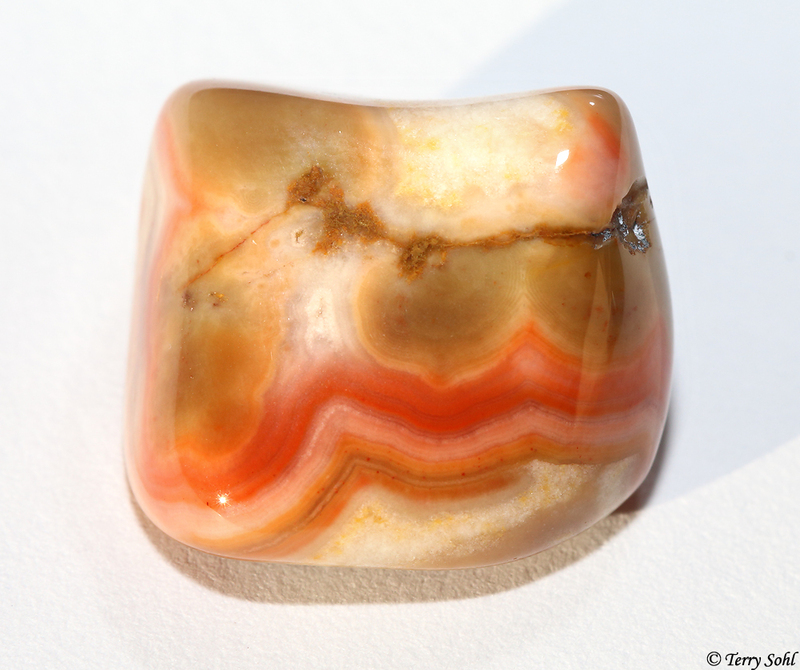 This beautiful Prairie Agate has some wonderful banding patterns, and a beautiful range of colors. 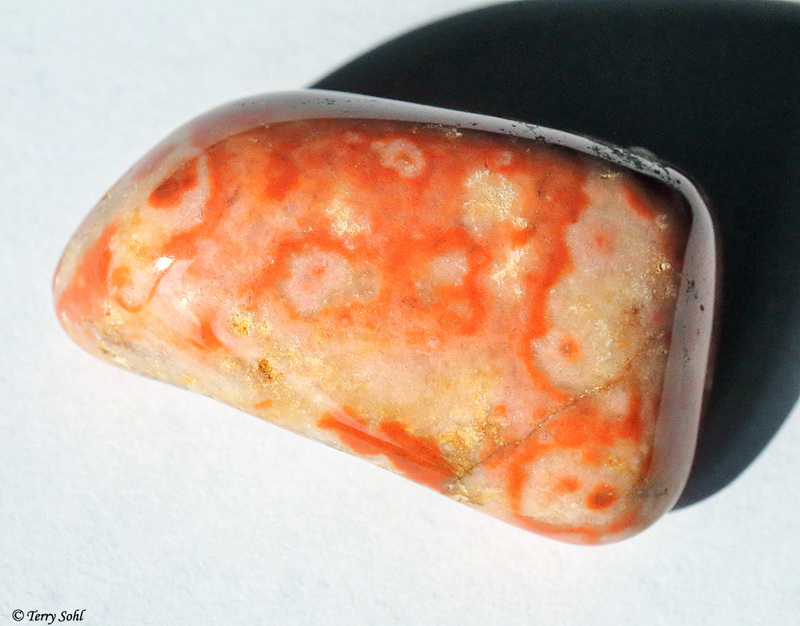 Another bubblegum agate with the typical eyes you see when polishing. I’m not sure what to call this one (help!!). 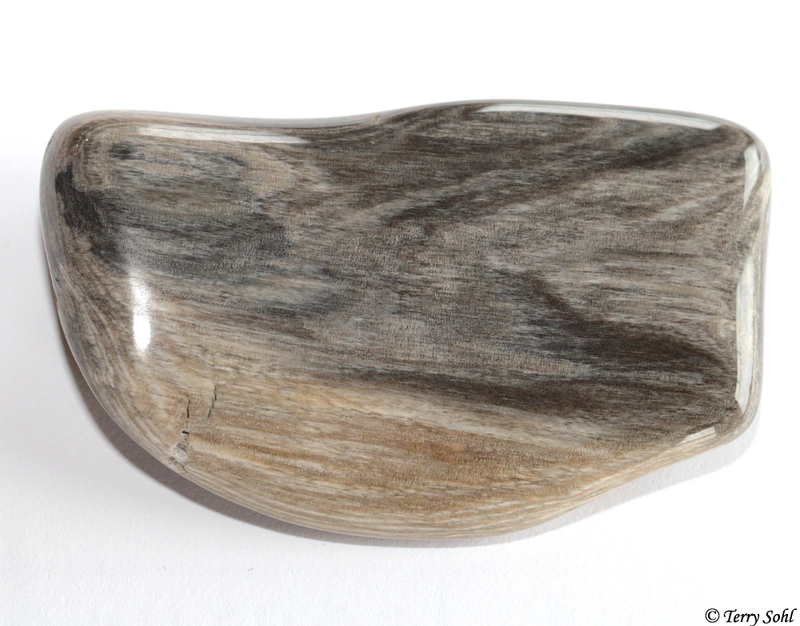 It has a definite linear “grain” pattern, but it’s so unlike all the petrified wood I’ve found that I hesitate to call it that. 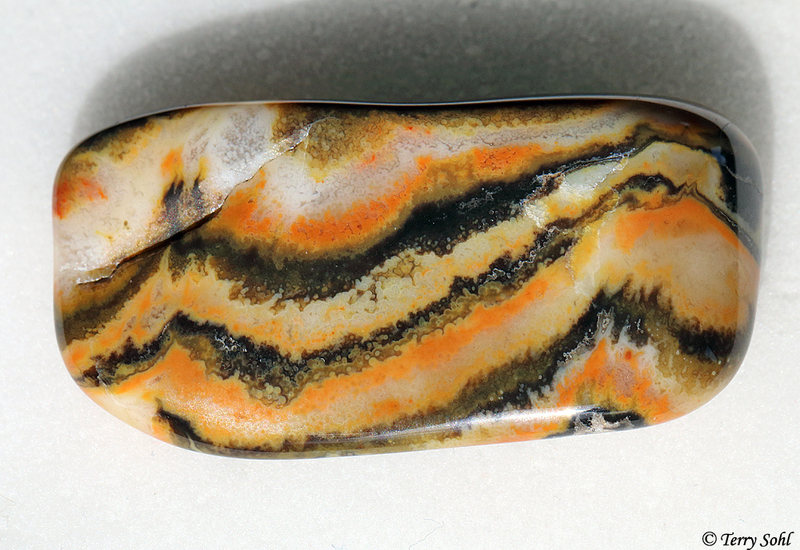 I love the pattern on this one, with the bold orange streak. 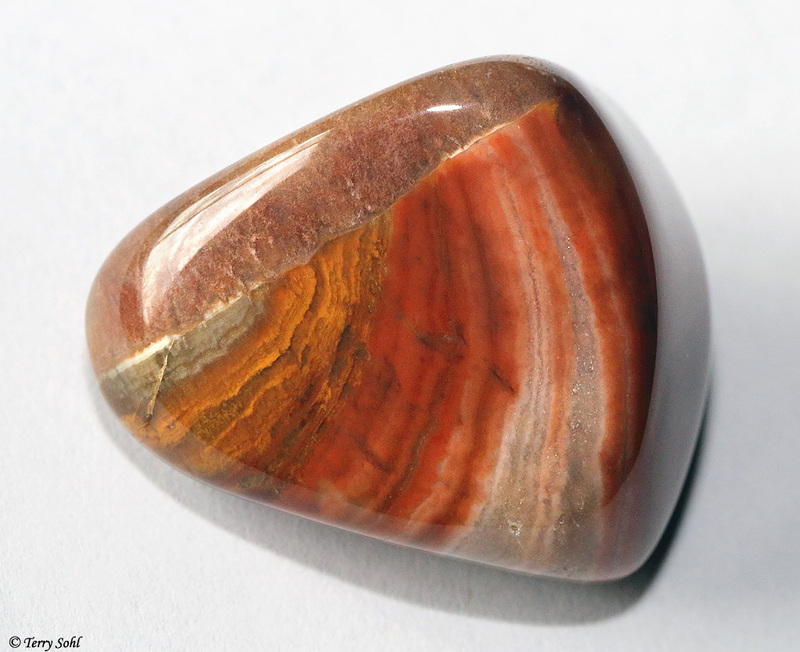 Jasper? 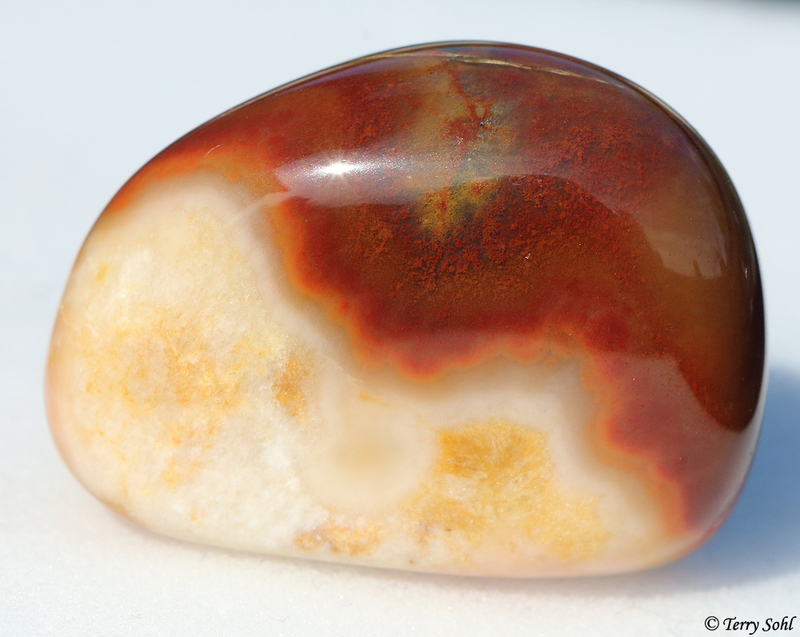 Agate? I dunno. Has a pretty pattern though! 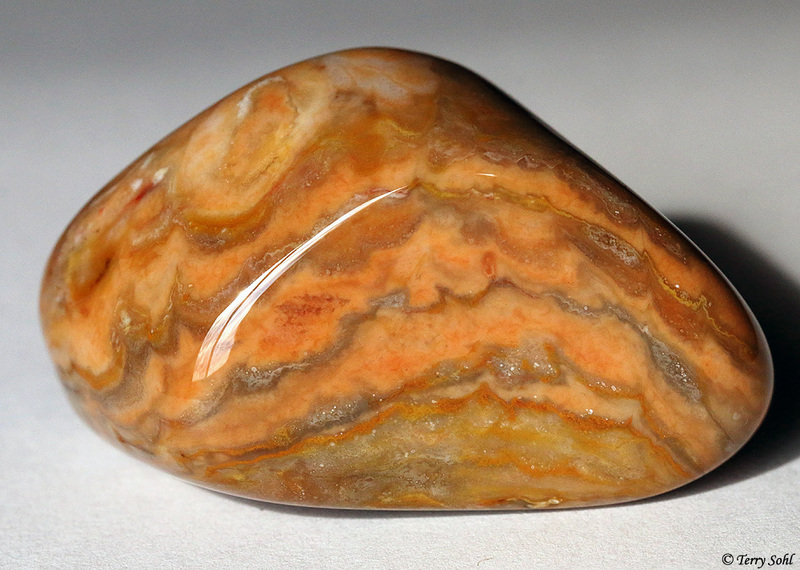 The most common prairie agate patterns are jagged, rough striping, but this is also a relatively common type of pattern and color for prairie agates from Buffalo Gap. 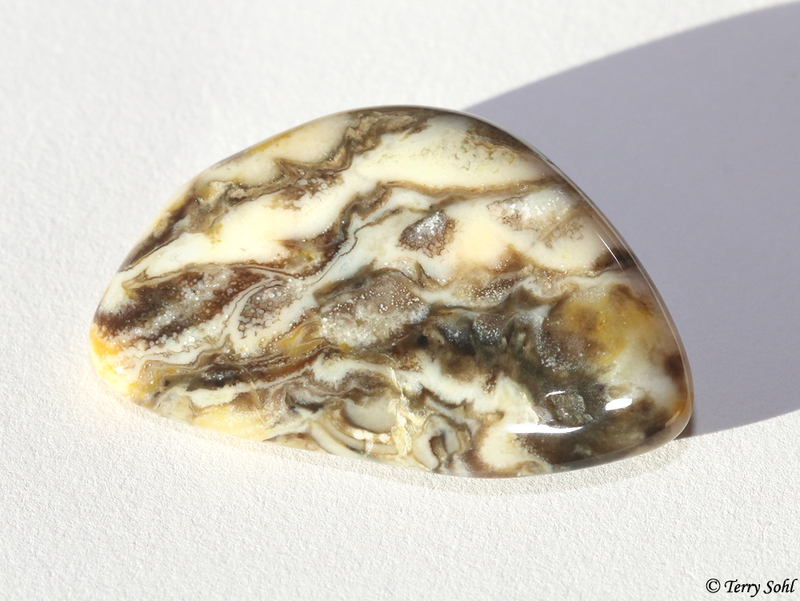 I love the contrasting patterns on some of the agates, with very dark sections contrasted by white or very light sections. 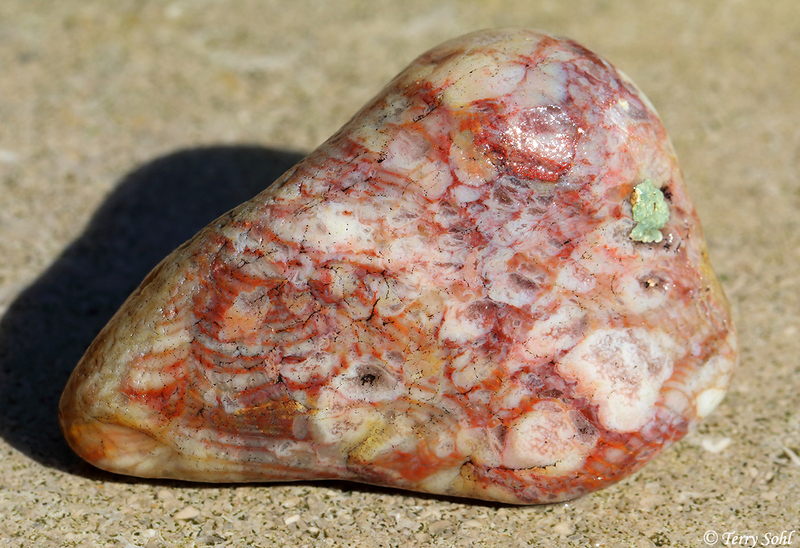 Another bubblegum agate, one that was tumbled awhile and didn’t maintain the “eyes” as much as some of the others. 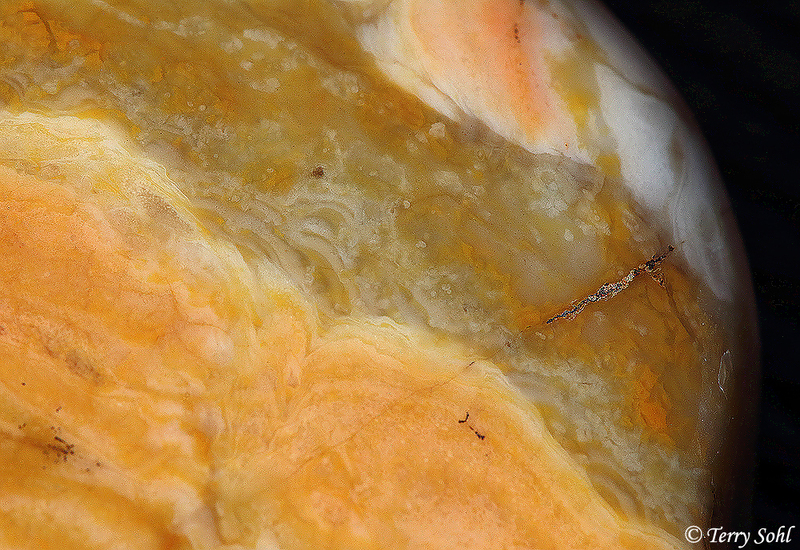 Probably the best Fairburn Agate I’ve found in my LONG and illustrious career as a rockhound (ok, in the 3 weeks I’ve been doing this). I paid the price for this one! I found it as far away from the car as I walked all day, and it started absolutely pouring on me just 1 minute after finding it. 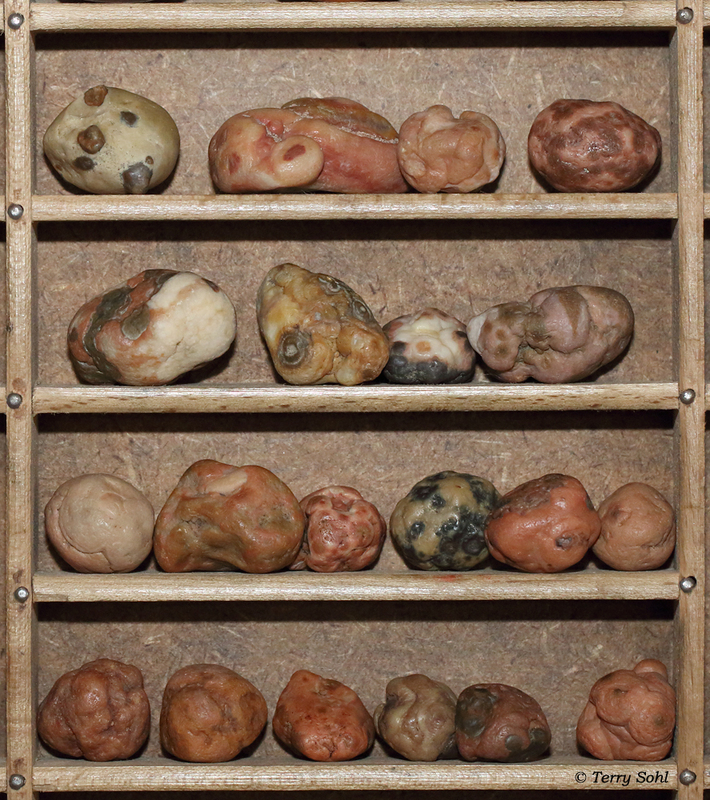 A collection of some of the best bubblegum agates from the day. The ones shown here are all small ones (1 1/2″ or less). A very large button (?) 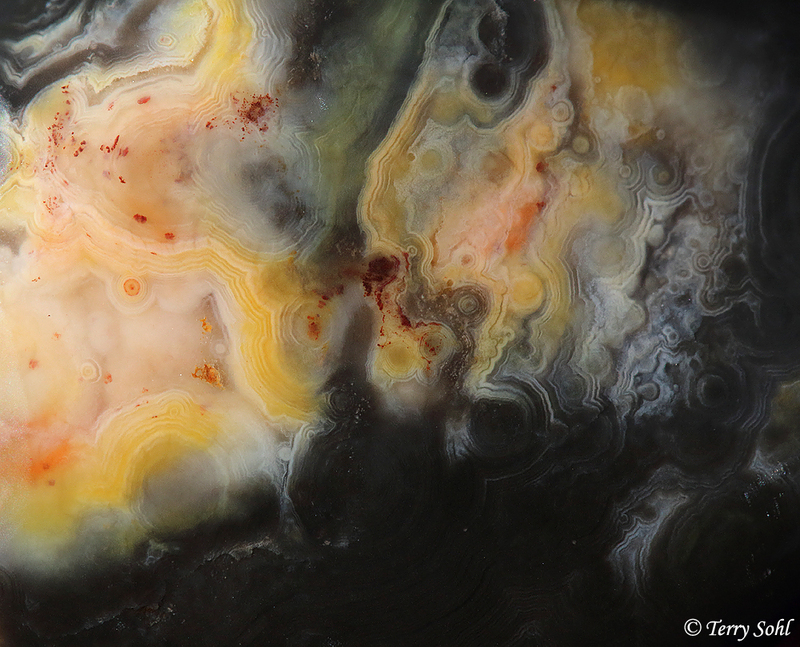 agate (about 3″ across). 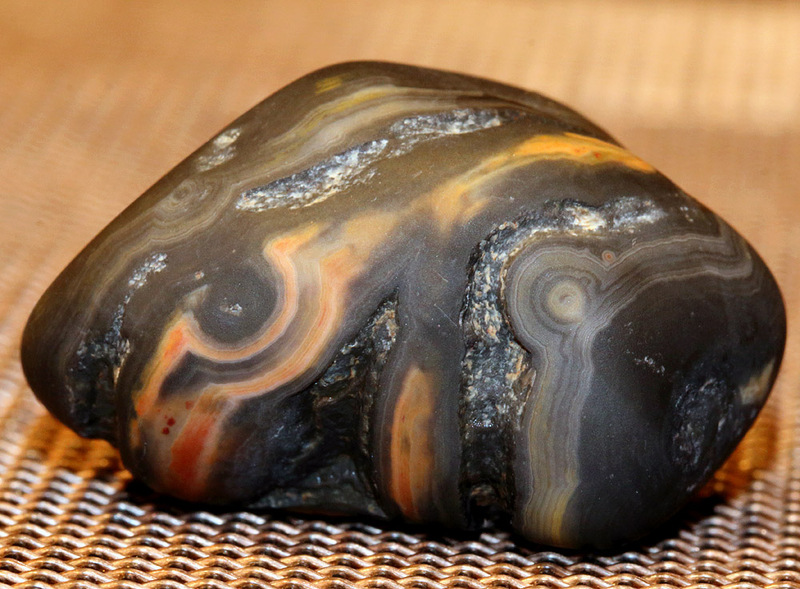 I haven’t found any agates like this that are so well preserved and so big. 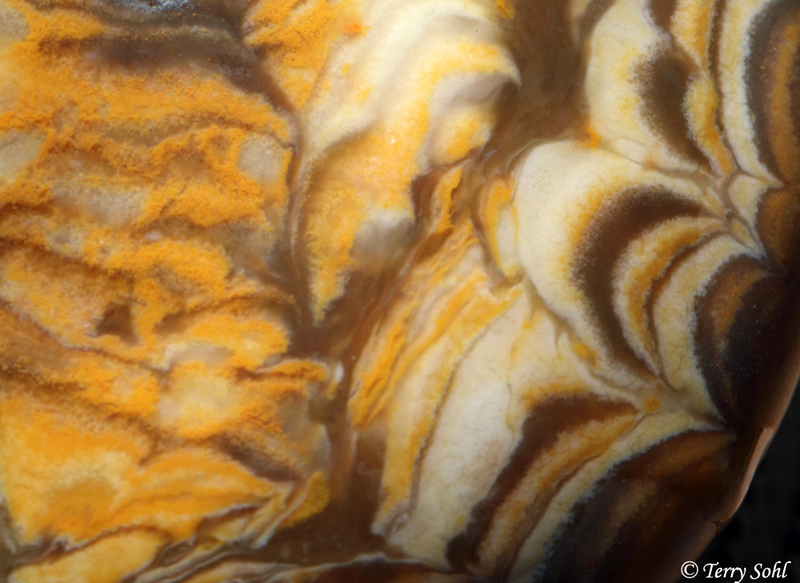 A bit of horn coral. 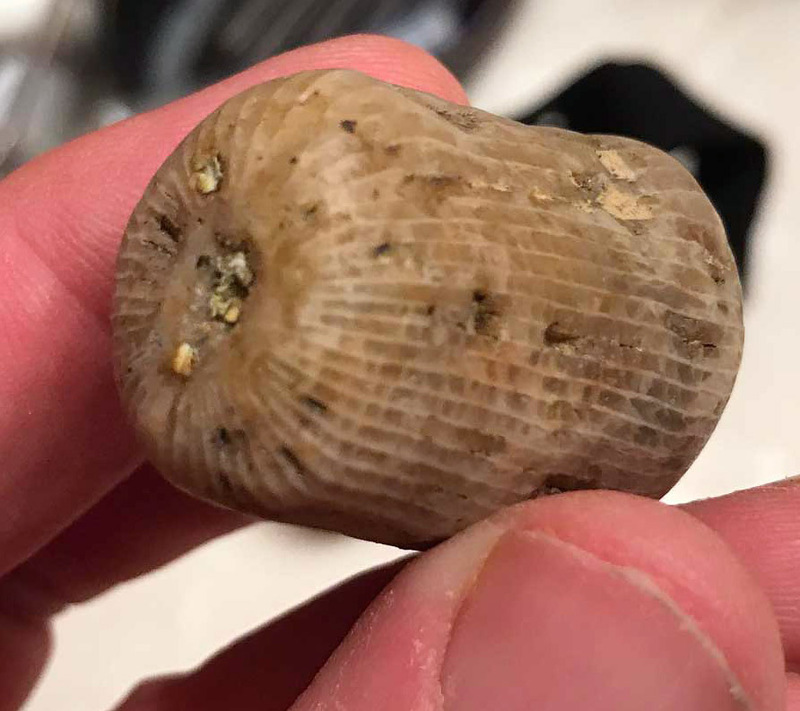 I’m told this is a “traveler”, that the geology of the area is too young to host this. 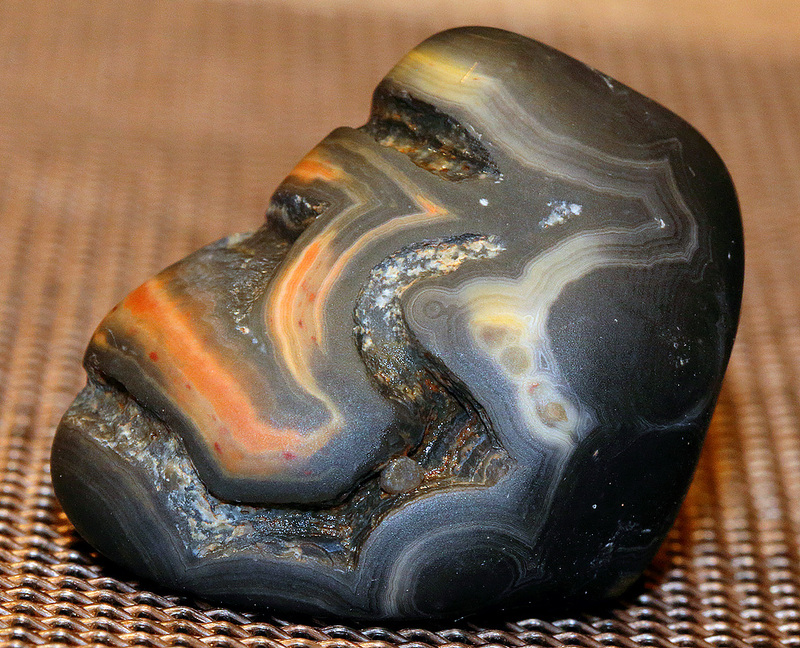 It’s a traveler from the Black Hills, washed down like the agates and other goodies you find here. 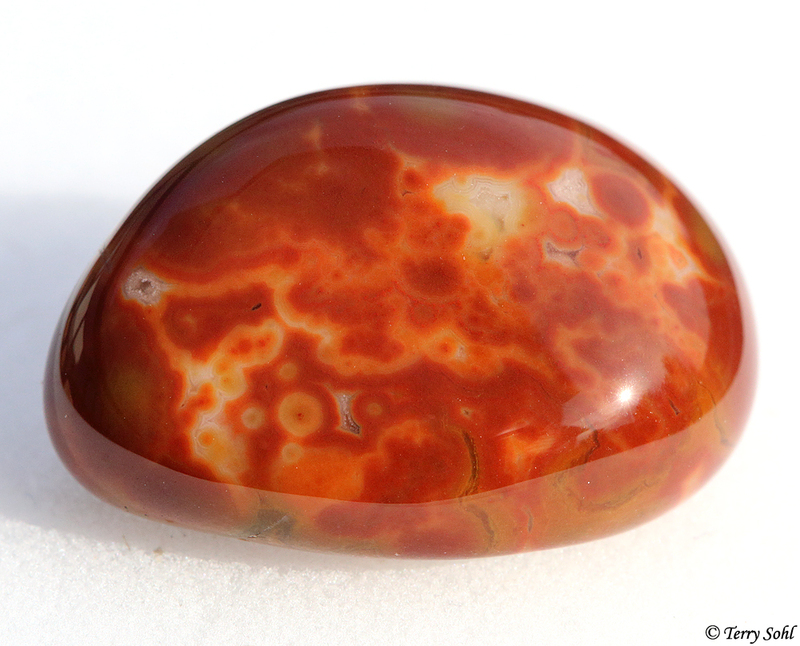 A rather unusual Prairie Agate. 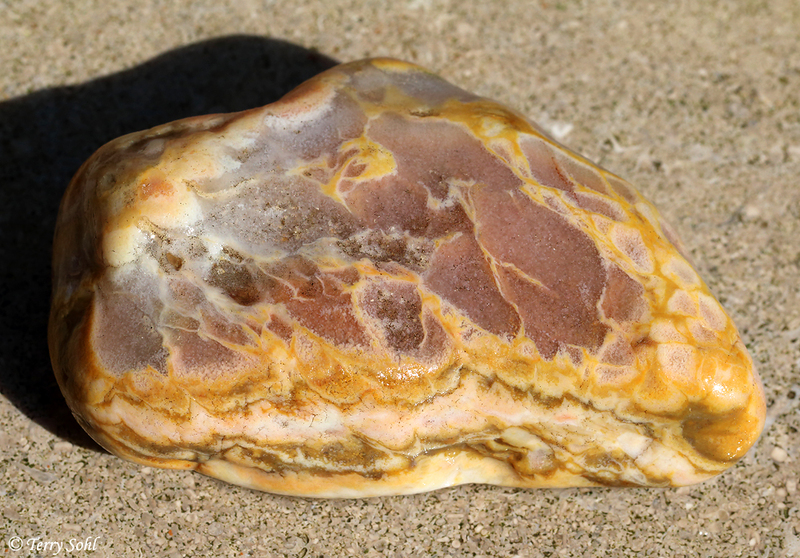 The rest of the agate looks like many typical prairie agates you find here, with the jagged, orangish-brown, diffuse banding. 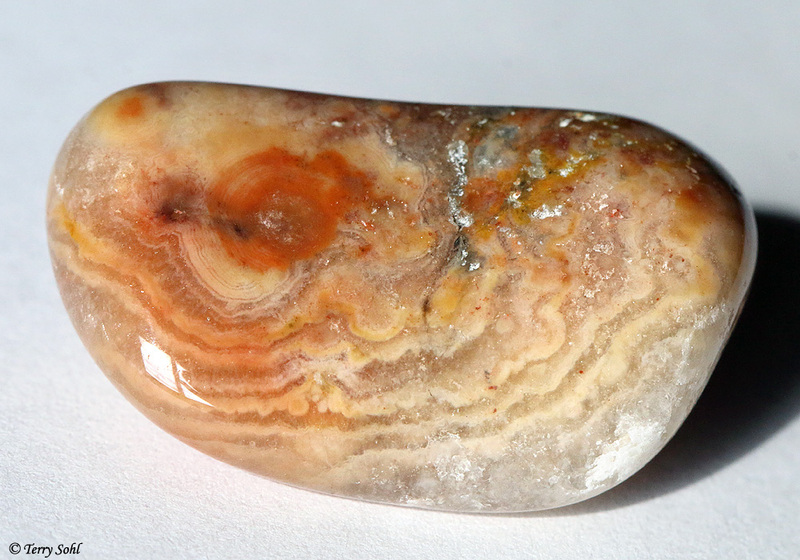 However, on this one side are these starkly different, very fine, parallel bands that are not found on any other prairie agate that I’ve found so far. Lacks the “holly leaf” pattern of a real Fairburn, but the thinness of the bands and their perfectly parallel nature reminds you of one. 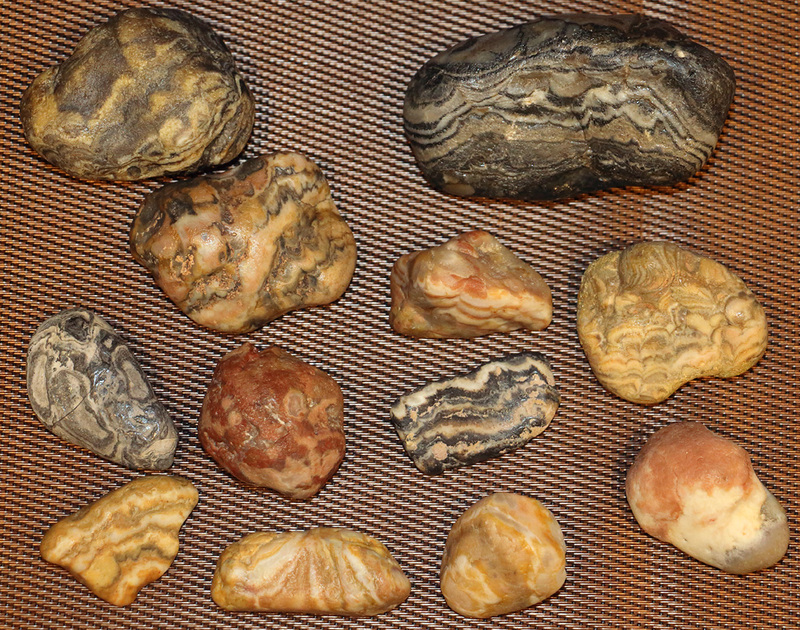 More typical prairie agates. 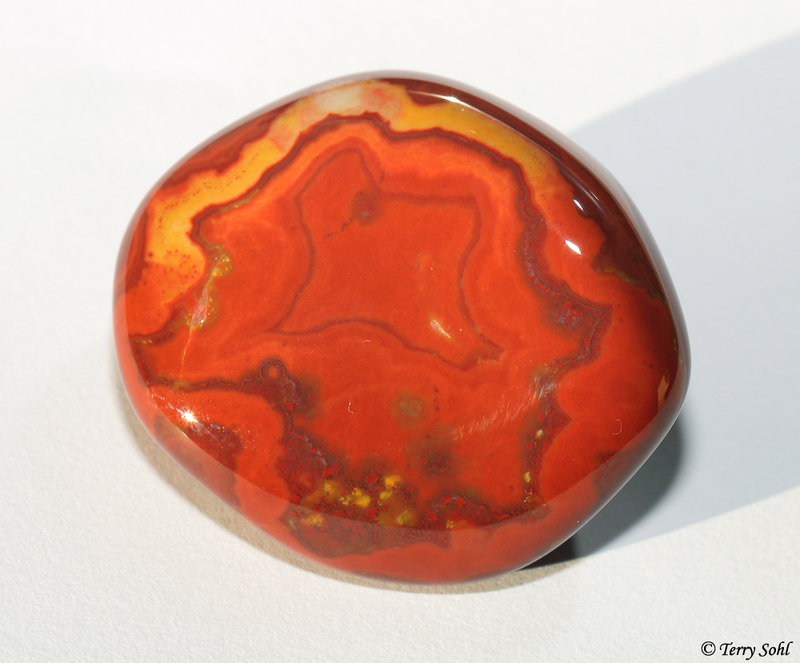 The ones you find most often are the ones with warm creamy and orangish tones, but there are also some cool ones with black, reddish-tones, or other colors. 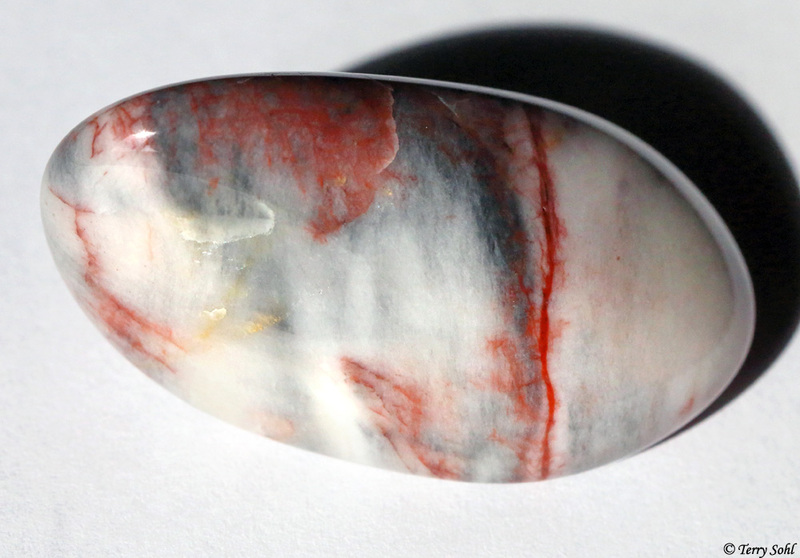 One day away from the 4th of July, so I thought it was very appropriate to bring back this red, white, and “blue” agate. The colors even are arranged correctly! 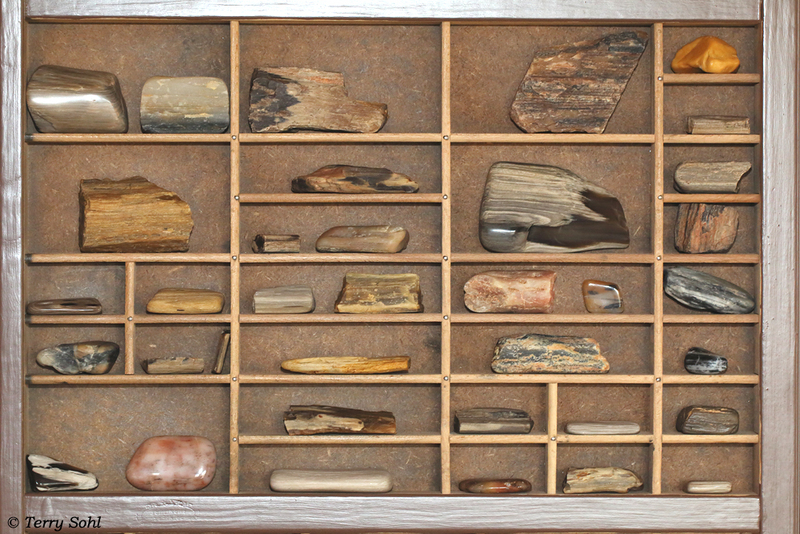 A variety of petrified wood pieces. This stuff is just everywhere, and occasionally you run across a much bigger piece that weighs several pounds. 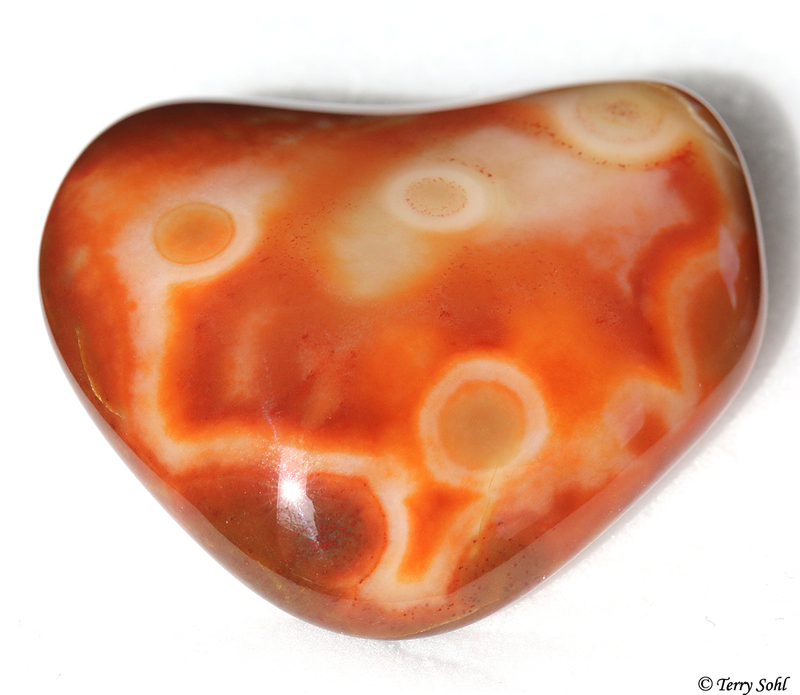 A large prairie agate (almost 4″ across) with an unusual pattern on one side. 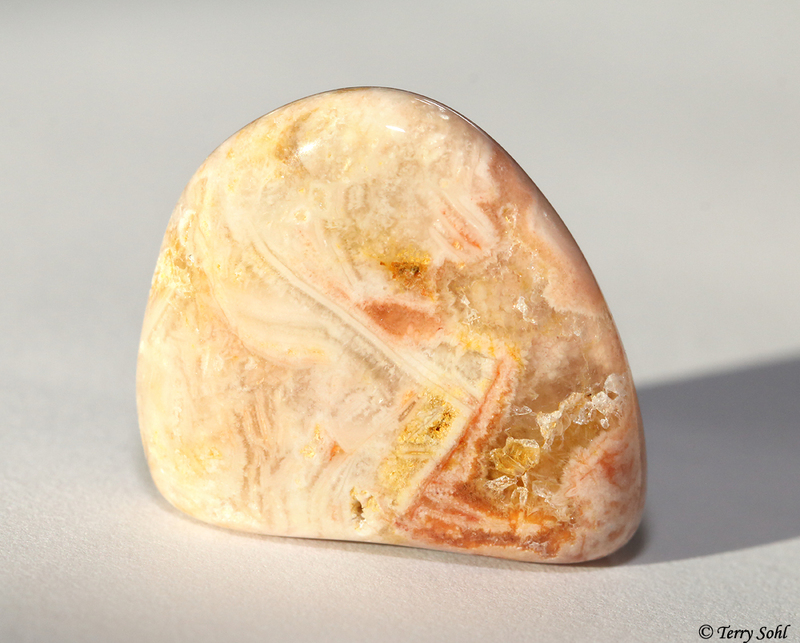 A bit bigger bubblegum agate…or at least that’s what I think it is. 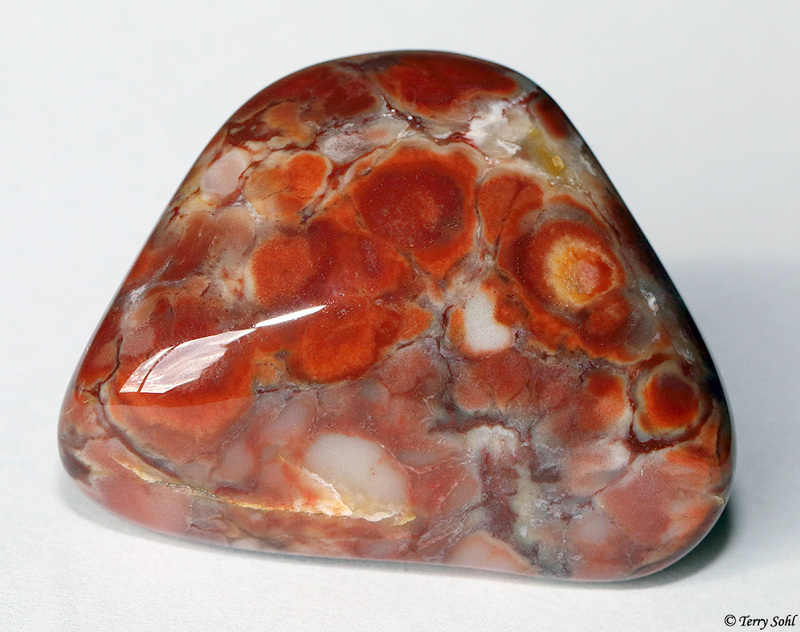 Reminds me I guess of what a really worn down bubblegum agate might look like, with the stuff in between the “eyes” wearing away more quickly? That’s my (very) amateur interpretation.